This is a very important LLVM class. It is the base class of all values computed by a program that may be used as operands to other values. Value is the super class of other important classes such as Instruction and Function. All Values have a Type. Type is not a subclass of Value. Some values can have a name and they belong to some Module. Setting the name on the Value automatically updates the module's symbol table. Every value has a "use list" that keeps track of which other Values are using this Value. A Value can also have an arbitrary number of ValueHandle objects that watch it and listen to RAUW and Destroy events. See llvm/IR/ValueHandle.h for details. Definition at line 72 of file Value.h. Definition at line 332 of file Value.h. Definition at line 369 of file Value.h. Definition at line 331 of file Value.h. Definition at line 368 of file Value.h. The number of operands in the subclass. This member is defined by this class, but not used for anything. Subclasses can use it to store their number of operands, if they have any. This is stored here to save space in User on 64-bit hosts. Since most instances of Value have operands, 32-bit hosts aren't significantly affected. Note, this should NOT be used directly by any class other than User. User uses this value to find the Use list. Definition at line 113 of file Value.h. An enumeration for keeping track of the concrete subclass of Value that is actually instantiated. 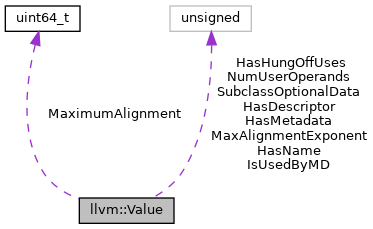 Values of this enumeration are kept in the Value classes SubclassID field. They are used for concrete type identification. Definition at line 444 of file Value.h. Definition at line 52 of file Value.cpp. References assert(), llvm::MCID::Call, llvm::Type::isFirstClassType(), llvm::Type::isStructTy(), and llvm::Type::isVoidTy(). Referenced by llvm::cl::ValuesClass::apply(), llvm::BasicBlock::getContext(), llvm::getValueProfDataFromInst(), setBranchWeights(), and ValuesOverlap(). Value's destructor should be virtual by design, but that would require that Value and all of its subclasses have a vtable that effectively duplicates the information in the value ID. As a size optimization, the destructor has been protected, and the caller should manually call deleteValue. Definition at line 72 of file Value.cpp. References assert(), llvm::dbgs(), getName(), llvm::ValueAsMetadata::handleDeletion(), isUsedByMetadata(), use_empty(), users(), and llvm::ValueHandleBase::ValueIsDeleted(). Definition at line 436 of file Value.h. Referenced by llvm::Use::set(), and llvm::Use::swap(). Definition at line 316 of file Value.h. Referenced by use_begin(), use_empty(), user_back(), user_begin(), user_empty(), users(), and uses(). Definition at line 351 of file Value.cpp. References assert(), llvm::dyn_cast(), llvm::GlobalValue::getParent(), and llvm::Module::isMaterialized(). Referenced by assertModuleIsMaterialized(), and hasName(). Definition at line 475 of file Value.h. Referenced by ClearSubclassDataAfterReassociation(), LinearizeExprTree(), and simplifyAssocCastAssoc(). Definition at line 98 of file Value.cpp. References llvm::StringMapEntry< ValueTy >::Destroy(), getValueID(), getValueName(), llvm_unreachable, Name, and setValueName(). Referenced by llvm::BitcodeReaderValueList::assignValue(), llvm::CloneFunction(), createAndInstr(), llvm::ilist_alloc_traits< Instruction >::deleteNode(), llvm::ilist_alloc_traits< MemoryAccess >::deleteNode(), llvm::JumpThreadingPass::DuplicateCondBranchOnPHIIntoPred(), FoldCondBranchOnPHI(), FunctionNumber(), isOnlyReachableViaThisEdge(), okayForPHIOfOps(), llvm::ValueDeleter::operator()(), shouldRotateLoopExitingLatch(), and llvm::sroa::AllocaSliceRewriter::visit(). If this value is a PHI node with CurBB as its parent, return the value in the PHI node corresponding to PredBB. If not, return ourself. This is useful if you want to know the value something has in a predecessor block. Definition at line 701 of file Value.cpp. Referenced by llvm::JumpThreadingPass::ComputeValueKnownInPredecessorsImpl(), DoPHITranslation(), foldOperationIntoPhiValue(), okayForPHIOfOps(), llvm::JumpThreadingPass::SimplifyPartiallyRedundantLoad(), and stripInBoundsOffsets(). Definition at line 585 of file Value.h. Definition at line 4361 of file AsmWriter.cpp. Referenced by analyzeLoopUnrollCost(), AreAliased(), AreSequentialAccesses(), buildMultiplyTree(), CheckMACMemory(), llvm::DebugLocEntry::Value::dump(), llvm::GVNExpression::Expression::dump(), dump(), dumpIR(), emitSignedInt64(), LoopFuser::fuseLoops(), getChainID(), getNarrowIntrinsic(), llvm::slpvectorizer::BoUpSLP::getSpillCost(), llvm::ExecutionEngine::InitializeMemory(), isUnconditionalBranch(), llvm::LoopPredicationPass::run(), llvm::GVN::run(), scaleWeights(), and sinkAndCmp0Expression(). Definition at line 709 of file Value.cpp. Referenced by llvm::GlobalVariable::addAttribute(), llvm::Function::addAttribute(), llvm::Function::addAttributes(), llvm::Function::addDereferenceableAttr(), llvm::Function::addDereferenceableOrNullAttr(), llvm::Function::addDereferenceableOrNullParamAttr(), llvm::Function::addDereferenceableParamAttr(), llvm::Function::addParamAttr(), llvm::Function::addParamAttrs(), llvm::LoopAccessInfo::addRuntimeChecks(), llvm::SelectInst::areInvalidOperands(), asmClobbersCTR(), BitCastConstantVector(), BuildConstantFromSCEV(), buildMultiplyTree(), canonicalizeSaturatedAdd(), CanShareConstantPoolEntry(), canTransformToMemCmp(), CC_MipsO32_FP64(), llvm::changeToUnreachable(), llvm::Function::clearGC(), llvm::FenceInst::cloneImpl(), llvm::UnreachableInst::cloneImpl(), CloneLoop(), collectInsertionElements(), collectShuffleElements(), collectSingleShuffleElements(), combineLoadToNewType(), combineLoadToOperationType(), llvm::ShuffleVectorInst::commute(), computeAddrSpace(), computeBytesPoppedByCalleeForSRet(), llvm::ComputeMultiple(), llvm::FunctionLoweringInfo::ComputePHILiveOutRegInfo(), computeRecurrenceType(), llvm::JumpThreadingPass::ComputeValueKnownInPredecessorsImpl(), llvm::ConstantFoldBinaryInstruction(), llvm::ConstantFoldCastInstruction(), llvm::ConstantFoldCompareInstruction(), llvm::ConstantFoldGetElementPtr(), llvm::ConstantFoldInsertElementInstruction(), llvm::ConstantFoldLoadThroughBitcast(), llvm::ConstantFoldShuffleVectorInstruction(), convert_i1_to_i8(), ConvertDoubleToBytes(), ConvertToSInt(), llvm::copyNonnullMetadata(), llvm::copyRangeMetadata(), llvm::SelectionDAGBuilder::CopyValueToVirtualRegister(), llvm::ARMConstantPoolConstant::Create(), llvm::CallBrInst::Create(), llvm::InnerLoopVectorizer::createBitOrPointerCast(), createCallInst(), llvm::IRBuilderBase::CreateElementUnorderedAtomicMemMove(), llvm::createFalkorMarkStridedAccessesPass(), llvm::InstCombiner::CreateNonTerminatorUnreachable(), llvm::createObjCARCOptPass(), CreatePrologue(), llvm::createSeparateConstOffsetFromGEPPass(), despeculateCountZeros(), detectShiftUntilZeroIdiom(), eliminateDeadSwitchCases(), emitSignedInt64(), evaluateInDifferentElementOrder(), expandBounds(), llvm::SCEVExpander::expandUnionPredicate(), llvm::SCEVExpander::expandWrapPredicate(), ExtractConstantBytes(), extractMDNode(), findBasePointer(), llvm::FindDbgAddrUses(), llvm::findDbgUsers(), llvm::findDbgValues(), findInitTrampoline(), foldBitcastExtElt(), foldConstantInsEltIntoShuffle(), foldCtpop(), foldCttzCtlz(), foldICmpShlOne(), foldInsSequenceIntoBroadcast(), llvm::InstCombiner::FoldShiftByConstant(), llvm::formLCSSAForInstructions(), genLoopLimit(), llvm::ConstantAggregateZero::get(), llvm::ValueAsMetadata::get(), llvm::ConstantPointerNull::get(), llvm::ConstantExpr::get(), llvm::UndefValue::get(), llvm::IRTranslator::getAnalysisUsage(), getArrayElements(), getAsConstantIndexedAddress(), llvm::GlobalVariable::getAttributesAsList(), getBoundsCheckCond(), llvm::GlobalValue::getComdat(), getComparePred(), llvm::LazyValueInfo::getConstant(), getConstantAt(), GetConstantInt(), llvm::LazyValueInfo::getConstantOnEdge(), llvm::ValueAsMetadata::getContext(), getEdgeValueLocal(), llvm::ConstantDataSequential::getElementAsConstant(), llvm::ConstantExpr::getExtractElement(), llvm::ConstantExpr::getExtractValue(), llvm::ConstantExpr::getFCmp(), getFPSequenceIfElementsMatch(), llvm::Function::getGC(), llvm::ConstantExpr::getGetElementPtr(), llvm::ConstantExpr::getICmp(), llvm::ValueAsMetadata::getIfExists(), llvm::ConstantExpr::getInsertElement(), llvm::ConstantExpr::getInsertValue(), getIntSequenceIfElementsMatch(), GetLoopInvariantInsertPosition(), getMemCmpLoad(), getName(), getNegativeIsTrueBoolVec(), llvm::CallBase::getNumSubclassExtraOperands(), llvm::getObjectSize(), getOffsetFromIndices(), getParentPad(), llvm::FastISel::getRegForValue(), getRelevantOperands(), GetRMWLibcall(), llvm::ConstantExpr::getSelect(), llvm::ConstantDataVector::getSplat(), getSqrtCall(), llvm::SITargetLowering::getTgtMemIntrinsic(), getTrueOrFalseValue(), getType(), llvm::ConstantStruct::getTypeForElements(), getUnderlyingArgReg(), getValueName(), handleBrSelExpect(), llvm::SelectionDAGBuilder::handleDebugValue(), llvm::Constant::handleOperandChange(), handleSwitchExpect(), hasSameExtUse(), INITIALIZE_PASS(), llvm::InlineFunction(), llvm::insertDebugValuesForPHIs(), insertLifetimeMarkersSurroundingCall(), isBroadcastShuffle(), llvm::isBytewiseValue(), llvm::CmpInst::isImpliedFalseByMatchingCmp(), isLoadInvariantInLoop(), isOrdered(), isReportingError(), isSupportedGuardInstruction(), llvm::LibCallSimplifier::LibCallSimplifier(), LLVMGetOperand(), LLVMSetParamAlignment(), lookThroughAnd(), llvm::BlockAddress::lookup(), llvm::IntrinsicLowering::LowerIntrinsicCall(), lowerSubFn(), llvm::makeGuardControlFlowExplicit(), makeStatepointExplicitImpl(), matchesOr(), mayLoopAccessLocation(), llvm::MergeBasicBlockIntoOnlyPred(), mergeCleanupPad(), mergeInlinedArrayAllocas(), llvm::EscapeEnumerator::Next(), OptimizeGlobalAddressOfMalloc(), optimizeMemCmpConstantSize(), OptimizeNoopCopyExpression(), optimizeVectorResize(), parseOptionalLinkageAux(), llvm::peelLoop(), false::LibCallsShrinkWrap::perform(), PerformHeapAllocSRoA(), llvm::CallBase::populateBundleOperandInfos(), processCallSite(), processCmp(), processOverflowIntrinsic(), processUDivOrURem(), processUGT_ADDCST_ADD(), llvm::pgo::promoteIndirectCall(), ReduceSwitchRange(), llvm::remapInstruction(), llvm::Function::removeAttribute(), llvm::Function::removeAttributes(), llvm::SwitchInst::removeCase(), llvm::Function::removeParamAttr(), llvm::Function::removeParamAttrs(), llvm::coro::replaceCoroFree(), llvm::replaceDbgValueForAlloca(), replaceExtractElements(), ReplaceFPIntrinsicWithCall(), ReplaceUsesOfWith(), rewriteDebugUsers(), RewriteUsesOfClonedInstructions(), llvm::salvageDebugInfoForDbgValues(), scalarizeMaskedCompressStore(), scalarizeMaskedExpandLoad(), scalarizeMaskedGather(), scalarizeMaskedLoad(), scalarizeMaskedScatter(), scalarizeMaskedStore(), llvm::FastISel::selectBinaryOp(), llvm::FastISel::selectFNeg(), llvm::MemIntrinsicBase< AnyMemIntrinsic >::setDestAlignment(), llvm::AtomicMemIntrinsic::setElementSizeInBytes(), llvm::Function::setEntryCount(), llvm::Function::setGC(), setNoClobberMetadata(), llvm::Instruction::setProfWeight(), llvm::Function::setPrologueData(), llvm::GlobalObject::setSection(), llvm::Function::setSectionPrefix(), setUsedInitializer(), setValueName(), shouldFixMainFunction(), ShrinkDemandedConstant(), shrinkFPConstant(), SimplifyICmpInst(), simplifyICmpWithBinOp(), simplifyNeonTbl1(), SimplifyRelativeLoad(), SimplifyTerminatorOnSelect(), simplifyX86extrq(), simplifyX86pshufb(), simplifyX86vpermilvar(), simplifyX86vpermv(), llvm::SplitCriticalEdge(), splitGlobal(), splitMergedValStore(), SRAGlobal(), TryToShrinkGlobalToBoolean(), tryUnmergingGEPsAcrossIndirectBr(), turnGuardIntoBranch(), TurnSwitchRangeIntoICmp(), llvm::UnreachableInst::UnreachableInst(), unswitchNontrivialInvariants(), unswitchTrivialBranch(), updateBranchWeights(), llvm::CallInst::updateProfWeight(), llvm::UpgradeBitCastExpr(), llvm::UpgradeBitCastInst(), llvm::UpgradeIntrinsicCall(), llvm::ValueHandleBase::ValueIsDeleted(), llvm::ValueHandleBase::ValueIsRAUWd(), llvm::sroa::AllocaSliceRewriter::visit(), llvm::InstCombiner::visitAllocSite(), llvm::InstCombiner::visitBitCast(), llvm::InstCombiner::visitExtractElementInst(), llvm::InstCombiner::visitIntToPtr(), llvm::InstCombiner::visitPtrToInt(), llvm::Interpreter::visitReturnInst(), llvm::InstCombiner::visitShuffleVectorInst(), llvm::InstCombiner::visitSwitchInst(), wrapConstantAsMetadata(), and X86ChooseCmpImmediateOpcode(). Return a constant reference to the value's name. This guaranteed to return the same reference as long as the value is not modified. If the value has a name, this does a hashtable lookup, so it's not free. Definition at line 214 of file Value.cpp. References assert(), llvm::StringMapEntry< ValueTy >::Create(), llvm::StringRef::empty(), llvm::StringRef::find_first_of(), getContext(), llvm::StringMapEntry< ValueTy >::getKey(), getSymTab(), getType(), getValueName(), hasName(), llvm::Twine::isTriviallyEmpty(), llvm::max(), NonGlobalValueMaxNameSize, llvm::StringRef::npos, llvm::StringMapEntry< ValueTy >::setValue(), setValueName(), llvm::StringRef::size(), llvm::ARM_MB::ST, llvm::StringRef::substr(), and llvm::Twine::toStringRef(). Referenced by AddAliasScopeMetadata(), llvm::SSAUpdaterBulk::AddAvailableValue(), addForcedAttributes(), llvm::SSAUpdaterBulk::AddUse(), llvm::X86FrameLowering::adjustForHiPEPrologue(), analyzeParsePointLiveness(), llvm::DiagnosticInfoOptimizationBase::Argument::Argument(), asmClobbersCTR(), assertBranchOrSelectConditionHoisted(), assureFPCallStub(), llvm::WinException::beginFunction(), llvm::CFGMST< Edge, BBInfo >::buildEdges(), buildFrameType(), buildMultiplyTree(), llvm::BlockFrequencyInfo::calculate(), llvm::BranchProbabilityInfo::calculate(), calculateCXXStateNumbers(), calculateSEHStateNumbers(), llvm::Interpreter::callExternalFunction(), callsiteIsHot(), llvm::canConstantFoldCallTo(), canCreateThunkFor(), canonicalizeLowbitMask(), canonicalizeSaturatedAdd(), CanPropagatePredecessorsForPHIs(), llvm::canRenameComdatFunc(), llvm::changeToInvokeAndSplitBasicBlock(), cheapToScalarize(), llvm::classifyEHPersonality(), llvm::CloneBasicBlock(), llvm::CloneFunction(), llvm::orc::cloneFunctionDecl(), llvm::orc::cloneGlobalAliasDecl(), llvm::orc::cloneGlobalVariableDecl(), cloneInstForMustTail(), CloneInstructionInExitBlock(), CloneLoop(), CloneLoopBlocks(), llvm::colorEHFunclets(), combineInstructionsOverFunction(), combineLoadToNewType(), llvm::InstCombiner::commonShiftTransforms(), compareNames(), computeAddrSpace(), llvm::ConstantFoldCall(), ConstructSSAForLoadSet(), llvm::convertToDeclaration(), ConvertToSInt(), llvm::CallInst::Create(), llvm::InvokeInst::Create(), llvm::CallBrInst::Create(), llvm::createBlockExtractorPass(), createClone(), llvm::createConstantHoistingPass(), createFPFnStub(), llvm::createGCInfoPrinter(), llvm::createPGOFuncNameMetadata(), CreatePrologue(), createReplacementInstr(), createResumeEntryBlock(), llvm::createScalarizerPass(), llvm::createSeparateConstOffsetFromGEPPass(), llvm::createShadowStackGCLoweringPass(), createWrapper(), llvm::VPBlockBase::deleteCFG(), deleteDeadInstruction(), llvm::DemotePHIToStack(), llvm::DemoteRegToStack(), llvm::NVPTXAsmPrinter::doFinalization(), llvm::AsmPrinter::doFinalization(), llvm::FunctionImportGlobalProcessing::doImportAsDefinition(), doPromotion(), llvm::GVNExpression::Expression::dump(), FusionCandidate::dump(), llvm::DomTreeUpdater::dump(), llvm::AliasSetTracker::dump(), llvm::CFGMST< Edge, BBInfo >::dumpEdges(), dumpIR(), llvm::JumpThreadingPass::DuplicateCondBranchOnPHIIntoPred(), llvm::DuplicateInstructionsInSplitBetween(), EmitCamlGlobal(), llvm::AsmPrinter::EmitDebugValue(), llvm::EmitGEPOffset(), llvm::ExecutionEngine::emitGlobals(), llvm::AMDGPU::HSAMD::MetadataStreamerV3::emitKernel(), llvm::AsmPrinter::EmitSpecialLLVMGlobal(), enableCallSafepoints(), llvm::LazyValueInfo::enableDT(), llvm::WinException::endFunclet(), eraseDeadBBsAndChildren(), llvm::Evaluator::EvaluateBlock(), EvaluateStaticConstructor(), llvm::VPBasicBlock::execute(), findBaseDefiningValueCached(), findBasePointer(), llvm::CodeExtractor::findInputsOutputs(), FindPredecessorAutoreleaseWithSafePath(), findReturnsToZap(), llvm::AMDGPULibCalls::fold(), llvm::foldBlockIntoPredecessor(), llvm::FoldBranchToCommonDest(), FoldCondBranchOnPHI(), foldICmpBitCast(), foldICmpShlOne(), foldICmpWithHighBitMask(), foldICmpWithMinMax(), foldLogicCastConstant(), foldOperationIntoSelectOperand(), llvm::InstCombiner::FoldShiftByConstant(), foldSignedTruncationCheck(), FoldTwoEntryPHINode(), forceRenaming(), forEachUser(), llvm::formLCSSAForInstructions(), FunctionNumber(), LoopFuser::fuseLoops(), getAllocationDataForFunction(), getArrayElements(), getBinOpsForFactorization(), llvm::bfi_detail::getBlockName(), getBranchHint(), getBranchInsertPoint(), llvm::sampleprof::FunctionSamples::getCanonicalFnName(), getChainID(), llvm::DOTGraphTraits< const Function * >::getCompleteNodeLabel(), llvm::Intrinsic::getDeclaration(), llvm::DeadArgumentEliminationPass::RetOrArg::getDescription(), getDescription(), getEdgeValueLocal(), getEncodedUnnamedAddr(), llvm::HexagonTargetObjectFile::getExplicitSectionGlobal(), llvm::TargetLoweringObjectFileELF::getExplicitSectionGlobal(), llvm::TargetLoweringObjectFileMachO::getExplicitSectionGlobal(), llvm::TargetLoweringObjectFileWasm::getExplicitSectionGlobal(), getFromRangeMetadata(), llvm::MachineBasicBlock::getFullName(), llvm::GlobalValue::getGlobalIdentifier(), GetGlobalTypeString(), llvm::DOTGraphTraits< const Function * >::getGraphName(), GetHeapSROAValue(), llvm::getInlineCost(), getInnermostLoopFor(), getLayoutSuccessorProbThreshold(), llvm::TargetLibraryInfoImpl::getLibFunc(), llvm::ExecutionEngine::getMangledName(), getMCSymbolForMBB(), getMinVisibility(), llvm::DiagnosticInfoOptimizationBase::getMsg(), getName(), llvm::StackSafetyInfo::FunctionInfo::getName(), llvm::MachineFunction::getName(), llvm::Mangler::getNameWithPrefix(), getNarrowIntrinsic(), getOpenCLAlignment(), llvm::GetOrCreateFunctionComdat(), llvm::AArch64InstrInfo::getOutliningType(), getParentPad(), llvm::getPGOFuncName(), GetPointerOperand(), llvm::orc::OrcMCJITReplacement::getPointerToFunction(), getPow(), getRetComponentType(), getRsrcReg(), llvm::getSamplerName(), getScalarIntrinsicDeclaration(), getSelectFoldableConstant(), getSignature(), llvm::DOTGraphTraits< const Function * >::getSimpleNodeLabel(), getSqrtCall(), getStartOrEndSlot(), llvm::ARMBaseTargetMachine::getSubtargetImpl(), getSuccPad(), getSuccState(), llvm::getSurfaceName(), llvm::getTextureName(), getTypePartition(), getVarName(), getVectorCallCost(), GlobalWasGeneratedByCompiler(), HandleByValArgument(), hasName(), hoist(), llvm::hoistRegion(), HoistThenElseCodeToIf(), INITIALIZE_PASS(), llvm::MIRParserImpl::initializeFrameInfo(), llvm::InlineFunction(), llvm::DivergenceAnalysis::inRegion(), insertLifetimeMarkersSurroundingCall(), llvm::InsertPreheaderForLoop(), insertUniqueBackedgeBlock(), instrumentMaskedLoadOrStore(), llvm::InternalizePass::internalizeModule(), isAlwaysFoldable(), isCalleeLoad(), isCallPromotable(), isDirectCall(), llvm::isFreeCall(), isFuncOrderCorrect(), isGCSafepointPoll(), llvm::HexagonTargetObjectFile::isGlobalInSmallSection(), isIgnorableInst(), isInPartition(), isInSymtab(), IsInterestingCmp(), isIntrinsicInline(), isKnownLibFunction(), isKnownTypeIdMember(), isLoadConditional(), isLoopInvariant(), llvm::TargetTransformInfoImplBase::isLoweredToCall(), isObjectDereferencedInBlock(), isOnlyReachableViaThisEdge(), isReassociableOp(), isReInterleaveMask(), isReportingError(), isSafeAndProfitableToSinkLoad(), isSafeToPromoteArgument(), isSortedByValueNo(), isTrivialLoopExitBlock(), isUnconditionalBranch(), isWrapperOnlyCall(), llvm::LibCallSimplifier::LibCallSimplifier(), llvm::LoadAndStorePromoter::LoadAndStorePromoter(), llvm::log2(), lookupFunction(), llvm::IntrinsicLowering::LowerIntrinsicCall(), llvm::TargetLoweringObjectFileCOFF::lowerRelativeReference(), llvm::IntrinsicLowering::LowerToByteSwap(), llvm::TargetLowering::LowerToTLSEmulatedModel(), makeStatepointExplicitImpl(), mapBinOpcode(), llvm::SparseSolver< LatticeKey, LatticeVal, KeyInfo >::MarkBlockExecutable(), MarkBlocksLiveIn(), matchDeMorgansLaws(), llvm::maybeMarkSanitizerLibraryCallNoBuiltin(), maybePrintComdat(), mayLoopAccessLocation(), mergeConstants(), moveUp(), nearest_common_dominator(), needsRuntimeRegistrationOfSectionRange(), llvm::TargetRegisterInfo::needsStackRealignment(), NegateValue(), normalizePBQPSpillWeight(), llvm::DiagnosticPrinterRawOStream::operator<<(), false::operator<<(), llvm::rdf::operator<<(), operator<<(), optimizeDoubleFP(), OptimizeGlobalAddressOfMalloc(), llvm::OptLevelChanger::OptLevelChanger(), llvm::AArch64::parseCPUArch(), llvm::ARM::parseCPUArch(), llvm::peelLoop(), PerformHeapAllocSRoA(), llvm::PHITransAddr::PHITranslateWithInsertion(), populateWorklist(), llvm::LinkDiagnosticInfo::print(), llvm::LegacyDivergenceAnalysis::print(), llvm::Trace::print(), llvm::ValueEnumerator::print(), llvm::MemoryDepChecker::Dependence::print(), llvm::GPUDivergenceAnalysis::print(), llvm::CallGraphNode::print(), llvm::MemoryPhi::print(), llvm::MachineBasicBlock::print(), llvm::DiagnosticInfoUnsupported::print(), llvm::BranchProbabilityInfo::printEdgeProbability(), printIRBlockReference(), printIRValueReference(), PrintLLVMName(), printNode(), printNodeDOT(), processAShr(), llvm::JumpThreadingPass::ProcessBlock(), processGlobal(), processInternalGlobal(), llvm::LoopVectorizePass::processLoop(), processLoopInVPlanNativePath(), processOverflowIntrinsic(), processSDiv(), processSRem(), llvm::JumpThreadingPass::ProcessThreadableEdges(), processUDivOrURem(), processUGT_ADDCST_ADD(), llvm::promoteLoopAccessesToScalars(), PushArgMD(), llvm::GVNHoist::rank(), llvm::Function::recalculateIntrinsicID(), llvm::ImportedFunctionsInliningStatistics::recordInline(), recoverFramePointer(), llvm::Intrinsic::remangleIntrinsicFunction(), rename(), replace(), ReplaceCallWith(), replaceDominatedUsesWith(), ReplaceUsesOfWith(), reportLoopFusion(), reportMayClobberedLoad(), RetagMask(), rewriteComdat(), RewriteHeapSROALoadUser(), rewriteMaterializableInstructions(), rewritePHIs(), RewriteUsesOfClonedInstructions(), llvm::LoopAccessInfoPrinterPass::run(), llvm::IRCEPass::run(), llvm::LoopDataPrefetchPass::run(), llvm::StackSafetyPrinterPass::run(), llvm::AAEvaluator::run(), llvm::PostDominatorTreePrinterPass::run(), llvm::SimpleLoopUnswitchPass::run(), llvm::InlinerPass::run(), llvm::PrintFunctionPass::run(), llvm::BlockFrequencyPrinterPass::run(), llvm::PhiValuesPrinterPass::run(), llvm::AssumptionPrinterPass::run(), llvm::DominanceFrontierPrinterPass::run(), llvm::BranchProbabilityPrinterPass::run(), llvm::WholeProgramDevirtPass::run(), llvm::DominatorTreePrinterPass::run(), llvm::PredicateInfoPrinterPass::run(), llvm::DevirtSCCRepeatedPass< PassT >::run(), llvm::DependenceAnalysisPrinterPass::run(), llvm::MemorySSAPrinterPass::run(), llvm::RegionInfoPrinterPass::run(), llvm::Float2IntPass::runImpl(), llvm::SLPVectorizerPass::runImpl(), llvm::JumpThreadingPass::runImpl(), llvm::runIPSCCP(), llvm::LegacyDivergenceAnalysis::runOnFunction(), llvm::DOTGraphTraitsViewer< AnalysisT, IsSimple, GraphT, AnalysisGraphTraitsT >::runOnFunction(), llvm::DOTGraphTraitsPrinter< AnalysisT, IsSimple, GraphT, AnalysisGraphTraitsT >::runOnFunction(), llvm::RGPassManager::runOnFunction(), llvm::LPPassManager::runOnFunction(), llvm::FPPassManager::runOnFunction(), llvm::DetectRoundChange::runOnMachineFunction(), llvm::SelectionDAGISel::runOnMachineFunction(), runSCCP(), llvm::InnerLoopVectorizer::scalarizeInstruction(), scaleWeights(), selectELFSectionForGlobal(), llvm::FastISel::selectInstruction(), selectJumpTableArmEncoding(), llvm::HexagonTargetObjectFile::SelectSectionForGlobal(), llvm::TargetLoweringObjectFileCOFF::SelectSectionForGlobal(), selectWasmSectionForGlobal(), setCoroInfo(), llvm::BranchProbabilityInfo::setEdgeProbability(), llvm::DwarfDebug::shareAcrossDWOCUs(), shouldApply(), llvm::HexagonTargetObjectFile::shouldPutJumpTableInFunctionSection(), shouldRotateLoopExitingLatch(), ShrinkDemandedConstant(), simplifyAllocaArraySize(), SimplifyBSwap(), SimplifyCondBranchToCondBranch(), SimplifyNVVMIntrinsic(), simplifyOneLoop(), llvm::JumpThreadingPass::SimplifyPartiallyRedundantLoad(), sinkInstruction(), sinkNotIntoXor(), llvm::sinkRegion(), llvm::BasicBlockPass::skipBasicBlock(), llvm::FunctionPass::skipFunction(), llvm::LoopPass::skipLoop(), llvm::RegionPass::skipRegion(), llvm::InstCombiner::SliceUpIllegalIntegerPHI(), SortCallTargets(), speculatePHINodeLoads(), speculateSelectInstLoads(), llvm::SplitBlock(), llvm::SplitBlockPredecessors(), splitCallSite(), llvm::SplitCriticalEdge(), llvm::DISubprogram::splitFlags(), splitGlobal(), llvm::SplitLandingPadPredecessors(), SRAGlobal(), StackMallocSizeClass(), StripSymtab(), suffixed_name_or(), llvm::JumpThreadingPass::ThreadEdge(), llvm::JumpThreadingPass::ThreadGuard(), truncateIVUse(), tryToOptimizeStoreOfMallocToGlobal(), TryToShrinkGlobalToBoolean(), tryToUnrollAndJamLoop(), tryToUnrollLoop(), TurnSwitchRangeIntoICmp(), TypeSizeToSizeIndex(), unpackLoadToAggregate(), unpackStoreToAggregate(), llvm::UnrollAndJamLoop(), llvm::UnrollLoop(), llvm::UnrollRuntimeLoopRemainder(), updateOperand(), UpdatePHINodes(), updatePredecessorProfileMetadata(), llvm::UpgradeIntrinsicCall(), UpgradeIntrinsicFunction1(), llvm::AMDGPULibCalls::useNative(), llvm::ValueHandleBase::ValueIsDeleted(), llvm::ValueHandleBase::ValueIsRAUWd(), Verify(), llvm::verifyModule(), llvm::LoopVersioning::versionLoop(), viewRegionInfo(), llvm::sroa::AllocaSliceRewriter::visit(), llvm::InstCombiner::visitAdd(), llvm::InstCombiner::visitAnd(), llvm::InstCombiner::visitCallInst(), llvm::InstCombiner::visitFPTrunc(), llvm::InstCombiner::visitGetElementPtrInst(), llvm::InstCombiner::visitLoadInst(), llvm::InstCombiner::visitMul(), llvm::InstCombiner::visitOr(), llvm::InstCombiner::visitSDiv(), llvm::InstCombiner::visitSExt(), llvm::InstCombiner::visitShuffleVectorInst(), llvm::InstCombiner::visitSRem(), llvm::InstCombiner::visitSub(), llvm::InstCombiner::visitTrunc(), llvm::InstCombiner::visitXor(), llvm::InstCombiner::visitZExt(), writeCFGToDotFile(), llvm::WriteIndexToFile(), llvm::OptLevelChanger::~OptLevelChanger(), ~Value(), and llvm::ValueSymbolTable::~ValueSymbolTable(). This is a linear time operation. Use hasOneUse, hasNUses, or hasNUsesOrMore to check for specific values. Definition at line 160 of file Value.cpp. Referenced by llvm::createSeparateConstOffsetFromGEPPass(), llvm::GVNExpression::Expression::dump(), FunctionNumber(), hasOneUse(), hasUsesOutsideLoop(), llvm::log2(), llvm::ValueEnumerator::print(), and relocationViaAlloca(). Returns an alignment which is either specified explicitly, e.g. via align attribute of a function argument, or guaranteed by DataLayout. Definition at line 646 of file Value.cpp. References llvm::AMDGPU::HSAMD::Kernel::Arg::Key::Align, assert(), llvm::DataLayout::getABITypeAlignment(), llvm::DataLayout::getFunctionPtrAlign(), llvm::DataLayout::getFunctionPtrAlignType(), llvm::ConstantInt::getLimitedValue(), llvm::DataLayout::getPreferredAlignment(), llvm::DataLayout::getPrefTypeAlignment(), getType(), llvm::DataLayout::Independent, llvm::Type::isSized(), llvm::max(), llvm::LLVMContext::MD_align, and llvm::DataLayout::MultipleOfFunctionAlign. Referenced by computeKnownBits(), llvm::ConstantFoldBinaryInstruction(), despeculateCountZeros(), isAligned(), and stripInBoundsOffsets(). If CanBeNull is set by this function the pointer can either be null or be dereferenceable up to the returned number of bytes. Definition at line 593 of file Value.cpp. References assert(), llvm::ConstantInt::getLimitedValue(), getType(), llvm::DataLayout::getTypeStoreSize(), llvm::Type::isSized(), llvm::LLVMContext::MD_dereferenceable, llvm::LLVMContext::MD_dereferenceable_or_null, and llvm::AttributeList::ReturnIndex. Referenced by isDereferenceableAndAlignedPointer(), and stripInBoundsOffsets(). This should only be used when testing two Values for equivalence. Definition at line 470 of file Value.h. Referenced by llvm::FunctionComparator::cmpOperations(), and llvm::ConstantExprKeyType::operator==(). Definition at line 654 of file Value.h. Referenced by llvm::Function::dropAllReferences(), llvm::BasicBlock::getLandingPadInst(), llvm::ConstantExpr::getOpcode(), llvm::BasicBlock::hasAddressTaken(), llvm::Function::setPrologueData(), llvm::Function::stealArgumentListFrom(), and llvm::Function::~Function(). Definition at line 244 of file Value.h. Referenced by llvm::GetElementPtrInst::accumulateConstantOffset(), llvm::AliasSetTracker::add(), addArgumentReturnedAttrs(), addAssumeNonNull(), llvm::SSAUpdater::AddAvailableValue(), addConditions(), llvm::AddOne(), llvm::RecurrenceDescriptor::AddReductionVar(), addStackMapLiveVars(), llvm::IVUsers::AddUsersImpl(), llvm::AMDGPUAAResult::alias(), aliasSameBasePointerGEPs(), alwaysAvailable(), llvm::VNCoercion::analyzeLoadFromClobberingLoad(), llvm::VNCoercion::analyzeLoadFromClobberingStore(), appendTypeSuffix(), ApplyX86MaskOn1BitsVec(), areExtractExts(), areExtractShuffleVectors(), llvm::SelectInst::areInvalidOperands(), areInverseVectorBitmasks(), areStridedAccessesIndependent(), llvm::AtomicCmpXchgInst::AtomicCmpXchgInst(), atomicSizeSupported(), BatchCommitValueTo(), llvm::BinaryOperator::BinaryOperator(), BitCastConstantVector(), BrPHIToSelect(), buildClonedLoopBlocks(), BuildConstantFromSCEV(), buildFrameType(), buildGEP(), buildMultiplyTree(), buildNew(), llvm::InnerLoopVectorizer::buildScalarSteps(), BuildSubAggregate(), llvm::DomTreeUpdater::callbackDeleteBB(), canAlwaysEvaluateInType(), llvm::VNCoercion::canCoerceMustAliasedValueToLoad(), llvm::canConstantFoldCallTo(), canEvaluateSExtd(), canEvaluateShiftedShift(), canEvaluateShuffled(), canEvaluateTruncated(), canEvaluateZExtd(), llvm::FastISel::canFoldAddIntoGEP(), canFoldIVIncExpr(), llvm::slpvectorizer::BoUpSLP::canMapToVector(), canNarrowShiftAmt(), canonicalizeBitCastExtElt(), canonicalizeCmpWithConstant(), canonicalizeICmpBool(), canonicalizeLowbitMask(), canonicalizeSaturatedAdd(), llvm::canReplaceOperandWithVariable(), CanShareConstantPoolEntry(), canSinkInstructions(), canTransformToMemCmp(), canTrapImpl(), canVectorizeInst(), llvm::Evaluator::castCallResultIfNeeded(), llvm::CastInst::castIsValid(), castRequiresQueuePtr(), llvm::castToCStr(), CC_MipsO32_FP64(), llvm::AArch64TargetLowering::CCAssignFnForReturn(), cheapToScalarize(), checkFunctionMemoryAccess(), llvm::FPMathOperator::classof(), llvm::ExtractValueInst::classof(), llvm::CallBrInst::classof(), llvm::TypeFinder::clear(), clearAssumptionsOfUsers(), llvm::CloneAndPruneIntoFromInst(), cloneConstantExprWithNewAddressSpace(), llvm::AllocaInst::cloneImpl(), llvm::LoadInst::cloneImpl(), llvm::VAArgInst::cloneImpl(), llvm::TruncInst::cloneImpl(), llvm::ZExtInst::cloneImpl(), llvm::SExtInst::cloneImpl(), llvm::FPTruncInst::cloneImpl(), llvm::FPExtInst::cloneImpl(), llvm::UIToFPInst::cloneImpl(), llvm::SIToFPInst::cloneImpl(), llvm::FPToUIInst::cloneImpl(), llvm::FPToSIInst::cloneImpl(), llvm::IntToPtrInst::cloneImpl(), llvm::PtrToIntInst::cloneImpl(), llvm::BitCastInst::cloneImpl(), llvm::AddrSpaceCastInst::cloneImpl(), cloneInstructionWithNewAddressSpace(), CloneLoop(), CloneLoopBlocks(), llvm::FunctionComparator::cmpBasicBlocks(), llvm::FunctionComparator::cmpConstants(), llvm::FunctionComparator::cmpOperations(), collectBitParts(), collectInsertionElements(), llvm::LoopVectorizationCostModel::collectInstsToScalarize(), collectShuffleElements(), collectSingleShuffleElements(), llvm::LoopVectorizationPlanner::collectTriviallyDeadInstructions(), combineLoadToNewType(), combineLoadToOperationType(), combineStoreToNewValue(), combineStoreToValueType(), llvm::InstCombiner::commonCastTransforms(), llvm::InstCombiner::commonIDivTransforms(), llvm::InstCombiner::commonShiftTransforms(), llvm::ShuffleVectorInst::commute(), CompareValueComplexity(), llvm::ObjectSizeOffsetVisitor::compute(), llvm::ObjectSizeOffsetEvaluator::compute(), computeBytesPoppedByCalleeForSRet(), llvm::computeConstantRange(), computeKillSet(), computeKnownBits(), computeKnownBitsFromOperator(), computeLiveOutSeed(), llvm::computeMinimumValueSizes(), llvm::ComputeMultiple(), ComputeNumSignBitsImpl(), llvm::computeOverflowForSignedMul(), llvm::computeOverflowForUnsignedMul(), llvm::FunctionLoweringInfo::ComputePHILiveOutRegInfo(), computePointerICmp(), ComputePostOrders(), computeRecurrenceType(), computeUnsignedMinMaxValuesFromKnownBits(), llvm::JumpThreadingPass::ComputeValueKnownInPredecessorsImpl(), concatenateTwoVectors(), llvm::concatenateVectors(), concatSubVector(), ConnectProlog(), llvm::ConstantAggregate::ConstantAggregate(), llvm::ConstantFoldBinaryInstruction(), llvm::ConstantFoldCastInstruction(), llvm::ConstantFoldCastOperand(), llvm::ConstantFoldCompareInstOperands(), llvm::ConstantFoldCompareInstruction(), llvm::ConstantFoldExtractElementInstruction(), llvm::ConstantFoldGetElementPtr(), llvm::ConstantFoldInsertElementInstruction(), llvm::ConstantFoldInsertValueInstruction(), llvm::ConstantFoldLoadFromConstPtr(), llvm::ConstantFoldLoadThroughBitcast(), llvm::ConstantFoldSelectInstruction(), llvm::ConstantFoldShuffleVectorInstruction(), constantFoldUser(), ConstructSSAForLoadSet(), contains(), llvm::Constant::containsConstantExpression(), llvm::Constant::containsUndefElement(), llvm::ConvertDebugDeclareToDebugValue(), ConvertDoubleToBytes(), ConvertShiftToMul(), ConvertToSInt(), convertValue(), llvm::copyNonnullMetadata(), llvm::copyRangeMetadata(), llvm::SelectionDAGBuilder::CopyToExportRegsIfNeeded(), llvm::SelectionDAGBuilder::CopyValueToVirtualRegister(), llvm::BinaryOperator::Create(), llvm::ConstantExprKeyType::create(), llvm::GetElementPtrInst::Create(), llvm::UnaryOperator::Create(), llvm::CallInst::Create(), llvm::InvokeInst::Create(), llvm::CallBrInst::Create(), CreateAdd(), llvm::IRBuilder< TargetFolder >::CreateAlignedLoad(), llvm::IRBuilder< TargetFolder >::CreateAlignmentAssumption(), llvm::IRBuilder< TargetFolder >::CreateAnd(), createAndInstr(), llvm::IRBuilder< TargetFolder >::CreateAShr(), llvm::IRBuilderBase::CreateAssumption(), llvm::IRBuilderBase::CreateBinaryIntrinsic(), llvm::CastInst::CreateBitOrPointerCast(), llvm::InnerLoopVectorizer::createBitOrPointerCast(), llvm::IRBuilder< TargetFolder >::CreateBitOrPointerCast(), llvm::IRBuilder< TargetFolder >::CreateCall(), createCallInst(), llvm::TargetFolder::CreateCast(), createCast(), llvm::IRBuilder< TargetFolder >::CreateCast(), createCmpXchgInstFun(), llvm::createDeadArgHackingPass(), llvm::IRBuilderBase::CreateElementUnorderedAtomicMemCpy(), llvm::IRBuilderBase::CreateElementUnorderedAtomicMemMove(), llvm::IRBuilderBase::CreateElementUnorderedAtomicMemSet(), llvm::IRBuilder< TargetFolder >::CreateExtractInteger(), llvm::IRBuilderBase::CreateFAddReduce(), createFFSIntrinsic(), llvm::IRBuilderBase::CreateFMulReduce(), llvm::BinaryOperator::CreateFNeg(), llvm::BinaryOperator::CreateFNegFMF(), llvm::TargetFolder::CreateFPCast(), llvm::CastInst::CreateFPCast(), llvm::IRBuilder< TargetFolder >::CreateFPCast(), createFree(), llvm::CallInst::CreateFree(), CreateGCStatepointCallCommon(), CreateGCStatepointInvokeCommon(), createGlobalFwdRef(), llvm::IRBuilderBase::CreateGlobalString(), llvm::createHWAddressSanitizerPass(), llvm::TargetFolder::CreateIntCast(), llvm::IRBuilder< TargetFolder >::CreateIntCast(), llvm::CastInst::CreateIntegerCast(), llvm::IRBuilderBase::CreateInvariantStart(), llvm::IRBuilder< TargetFolder >::CreateInvoke(), llvm::IRBuilder< TargetFolder >::CreateIsNotNull(), llvm::IRBuilder< TargetFolder >::CreateIsNull(), llvm::IRBuilder< TargetFolder >::CreateLaunderInvariantGroup(), llvm::IRBuilderBase::CreateLifetimeEnd(), llvm::IRBuilderBase::CreateLifetimeStart(), llvm::IRBuilder< TargetFolder >::CreateLoad(), llvm::IRBuilder< TargetFolder >::CreateLShr(), createMalloc(), createMaskedBitTest(), llvm::IRBuilderBase::CreateMaskedGather(), llvm::IRBuilderBase::CreateMaskedLoad(), llvm::IRBuilderBase::CreateMaskedScatter(), llvm::IRBuilderBase::CreateMaskedStore(), createMaskInstrs(), llvm::IRBuilderBase::CreateMemCpy(), llvm::createMemCpyLoopKnownSize(), llvm::createMemCpyLoopUnknownSize(), llvm::IRBuilderBase::CreateMemMove(), createMemMoveLoop(), llvm::IRBuilderBase::CreateMemSet(), createMemSetLoop(), CreateMul(), CreateNeg(), llvm::BinaryOperator::CreateNeg(), llvm::BinaryOperator::CreateNot(), llvm::BinaryOperator::CreateNSWNeg(), llvm::BinaryOperator::CreateNUWNeg(), llvm::createObjCARCOptPass(), llvm::IRBuilder< TargetFolder >::CreateOr(), createOrdering(), llvm::InstCombiner::CreateOverflowTuple(), llvm::createPGOFuncNameVar(), llvm::TargetFolder::CreatePointerBitCastOrAddrSpaceCast(), llvm::CastInst::CreatePointerBitCastOrAddrSpaceCast(), llvm::IRBuilder< TargetFolder >::CreatePointerBitCastOrAddrSpaceCast(), llvm::TargetFolder::CreatePointerCast(), llvm::CastInst::CreatePointerCast(), llvm::IRBuilder< TargetFolder >::CreatePointerCast(), createPopcntIntrinsic(), llvm::createPrivateGlobalForString(), createPrivateNonConstGlobalForString(), llvm::createProfileFileNameVar(), llvm::IRBuilder< TargetFolder >::CreatePtrDiff(), createRdxShuffleMask(), createReplacementInstr(), llvm::VPRecipeBuilder::createReplicateRegion(), createRetPHINode(), llvm::createScalarizerPass(), llvm::createSeparateConstOffsetFromGEPPass(), llvm::TargetFolder::CreateSExtOrBitCast(), llvm::CastInst::CreateSExtOrBitCast(), llvm::IRBuilder< TargetFolder >::CreateSExtOrBitCast(), llvm::IRBuilder< TargetFolder >::CreateSExtOrTrunc(), llvm::createShadowStackGCLoweringPass(), llvm::IRBuilder< TargetFolder >::CreateShl(), llvm::createSimpleTargetReduction(), llvm::IRBuilder< TargetFolder >::CreateStripInvariantGroup(), llvm::TargetFolder::CreateTruncOrBitCast(), llvm::CastInst::CreateTruncOrBitCast(), llvm::IRBuilder< TargetFolder >::CreateTruncOrBitCast(), llvm::IRBuilderBase::CreateUnaryIntrinsic(), llvm::InnerLoopVectorizer::createVectorizedLoopSkeleton(), llvm::IRBuilder< TargetFolder >::CreateVectorSplat(), createWrapper(), llvm::IRBuilder< TargetFolder >::CreateXor(), llvm::TargetFolder::CreateZExtOrBitCast(), llvm::CastInst::CreateZExtOrBitCast(), llvm::IRBuilder< TargetFolder >::CreateZExtOrBitCast(), llvm::IRBuilder< TargetFolder >::CreateZExtOrTrunc(), llvm::DecodePSHUFBMask(), llvm::DecodeVPERMIL2PMask(), llvm::DecodeVPERMILPMask(), llvm::DecodeVPERMV3Mask(), llvm::DecodeVPERMVMask(), llvm::DecodeVPPERMMask(), llvm::decomposeBitTestICmp(), decomposeBitTestICmp(), decomposeSimpleLinearExpr(), deleteDeadInstruction(), llvm::DemotePHIToStack(), llvm::DemoteRegToStack(), despeculateCountZeros(), llvm::DetatchDeadBlocks(), detectShiftUntilZeroIdiom(), determinePointerReadAttrs(), doPromotion(), llvm::GVNExpression::Expression::dump(), eliminateDeadSwitchCases(), eliminateRecursiveTailCall(), llvm::emitBinaryFloatFnCall(), emitDebugValueComment(), llvm::emitFGetCUnlocked(), llvm::emitFGetSUnlocked(), llvm::emitFPutC(), llvm::emitFPutCUnlocked(), llvm::emitFPutS(), llvm::emitFPutSUnlocked(), llvm::emitFReadUnlocked(), llvm::emitFWrite(), llvm::emitFWriteUnlocked(), llvm::EmitGEPOffset(), llvm::AsmPrinter::EmitGlobalConstant(), emitGlobalConstantArray(), emitGlobalConstantFP(), emitGlobalConstantImpl(), emitGlobalConstantStruct(), llvm::HexagonTargetLowering::emitLoadLinked(), llvm::AArch64TargetLowering::emitLoadLinked(), llvm::ARMTargetLowering::emitLoadLinked(), llvm::InnerLoopVectorizer::emitMinimumIterationCountCheck(), emitSignedInt64(), llvm::HexagonTargetLowering::emitStoreConditional(), llvm::AArch64TargetLowering::emitStoreConditional(), llvm::ARMTargetLowering::emitStoreConditional(), llvm::emitStrNCpy(), llvm::RISCVTargetLowering::emitTrailingFence(), llvm::PPCTargetLowering::emitTrailingFence(), llvm::InnerLoopVectorizer::emitTransformedIndex(), llvm::emitUnaryFloatFnCall(), emitUnaryFloatFnCallHelper(), EmitX86ScalarSelect(), EmitX86Select(), llvm::ARMAsmPrinter::EmitXXStructor(), ensurePromotedGV(), ensureValueAvailableInSuccessor(), EqualityPropUnSafe(), EqualTypeSize(), EraseTerminatorAndDCECond(), llvm::Evaluator::EvaluateBlock(), EvaluateExpression(), evaluateFCmpRelation(), evaluateGEPOffsetExpression(), evaluateICmpRelation(), evaluateInDifferentElementOrder(), EvaluateStoreInto(), llvm::VPBranchOnMaskRecipe::execute(), llvm::VPPredInstPHIRecipe::execute(), llvm::VPlan::execute(), llvm::expandAtomicRMWToCmpXchg(), expandBounds(), llvm::SCEVExpander::expandCodeFor(), llvm::expandDivision(), llvm::expandDivisionUpTo32Bits(), llvm::expandDivisionUpTo64Bits(), llvm::ARMTargetLowering::ExpandInlineAsm(), llvm::X86TargetLowering::ExpandInlineAsm(), llvm::expandRemainder(), llvm::expandRemainderUpTo32Bits(), llvm::expandRemainderUpTo64Bits(), ExtractConstantBytes(), llvm::extractConstantMask(), ExtractImmediate(), extractInteger(), extractVector(), llvm::FenceInst::FenceInst(), FindAllMemoryUses(), llvm::FindAvailableLoadedValue(), findBaseDefiningValue(), findBaseDefiningValueOfVector(), findBasePointer(), findInitTrampoline(), llvm::CodeExtractor::findInputsOutputs(), llvm::FindInsertedValue(), findInsertPointAfter(), FindLIVLoopCondition(), findLoadAlignment(), FindLoopCounter(), findMatchingInlineAsmOperand(), llvm::findScalarElement(), findStoreAlignment(), findUnwindDestinations(), FitWeights(), FixedPointIntrinsicToOpcode(), llvm::InnerLoopVectorizer::fixReduction(), fixupFPReturnAndCall(), llvm::InnerLoopVectorizer::fixupIVUsers(), llvm::AMDGPULibCalls::fold(), foldAndOrOfEqualityCmpsWithConstants(), foldAnyOrAllBitsSet(), FoldBitCast(), foldBitCastBitwiseLogic(), foldBitcastExtElt(), foldBitCastSelect(), foldConstantCastPair(), foldConstantInsEltIntoShuffle(), foldCttzCtlz(), foldFDivConstantDivisor(), foldGuardedRotateToFunnelShift(), foldICmpBitCast(), foldICmpShlOne(), foldICmpWithHighBitMask(), foldICmpWithMinMax(), foldICmpWithTruncSignExtendedVal(), foldIdentityShuffles(), llvm::InstCombiner::FoldItoFPtoI(), foldLogicCastConstant(), foldLogOpOfMaskedICmps(), foldLogOpOfMaskedICmps_NotAllZeros_BMask_Mixed(), foldNoWrapAdd(), foldOperationIntoPhiValue(), foldOperationIntoSelectOperand(), foldSelectBinOpIdentity(), foldSelectICmpAnd(), foldSelectICmpAndOr(), llvm::InstCombiner::FoldShiftByConstant(), foldShiftedShift(), foldShuffleWithInsert(), foldSignedTruncationCheck(), foldToUnsignedSaturatedAdd(), FoldTwoEntryPHINode(), foldUDivPow2Cst(), foldUDivShl(), foldVectorCmp(), foldVecTruncToExtElt(), foldXorToXor(), forEachUser(), llvm::formLCSSAForInstructions(), llvm::StackSafetyInfo::FunctionInfo::FunctionInfo(), FunctionNumber(), LoopFuser::fuseLoops(), generateSignedDivisionCode(), generateSignedRemainderCode(), generateUnsignedDivisionCode(), genLoopLimit(), llvm::MemoryLocation::get(), llvm::ConstantFP::get(), llvm::ConstantAggregateZero::get(), llvm::ConstantArray::get(), llvm::ConstantVector::get(), llvm::ConstantPointerNull::get(), llvm::ConstantExpr::get(), llvm::UndefValue::get(), getAccessType(), getAddressForMemoryInput(), llvm::SITargetLowering::getAddrModeArguments(), llvm::ConstantExpr::getAddrSpaceCast(), getAdjustedPtr(), llvm::Constant::getAggregateElement(), getAISize(), getAlternateBinop(), llvm::IRTranslator::getAnalysisUsage(), GetAnyNonZeroConstInt(), llvm::SystemZTTIImpl::getArithmeticInstrCost(), getArrayElements(), getAsConstantIndexedAddress(), llvm::ConstantExpr::getAsInstruction(), getAtomicOpAlign(), getAtomicOpSize(), getBaseType(), llvm::ConstantExpr::getBinOpAbsorber(), getBinOpsForFactorization(), llvm::ConstantExpr::getBitCast(), getBoundsCheckCond(), getBranchCondString(), llvm::getCallsiteCost(), llvm::CastInst::getCastOpcode(), getChainID(), getCodeAddrSpace(), llvm::ConstantExpr::getCompare(), getCompareCC(), getComparePred(), GetCompareTy(), getConstantFromPool(), GetConstantInt(), llvm::VNCoercion::getConstantLoadValueForLoad(), llvm::SelectionDAG::getConstantPool(), llvm::LazyValueInfo::getConstantRange(), llvm::LazyValueInfo::getConstantRangeOnEdge(), llvm::ExecutionEngine::getConstantValue(), getConstantValueForReg(), llvm::BasicBlock::getContext(), llvm::Function::getContext(), llvm::IRBuilderBase::getCurrentFunctionReturnType(), llvm::Intrinsic::getDeclaration(), llvm::DemandedBits::getDemandedBits(), llvm::Argument::getDereferenceableBytes(), llvm::Argument::getDereferenceableOrNullBytes(), llvm::BitCastOperator::getDestTy(), getEdgeValueLocal(), llvm::ConstantDataSequential::getElementType(), llvm::ConstantAggregateZero::getElementValue(), llvm::UndefValue::getElementValue(), getEstimate(), llvm::ConstantExpr::getExtractElement(), llvm::ConstantExpr::getExtractValue(), llvm::ConstantExpr::getFCmp(), getFCmpValue(), llvm::ConstantExpr::getFNeg(), llvm::ConstantExpr::getFPCast(), llvm::ConstantExpr::getFPExtend(), llvm::ConstantExpr::getFPToSI(), llvm::ConstantExpr::getFPToUI(), llvm::ConstantExpr::getFPTrunc(), getFrameType(), getFromRangeMetadata(), llvm::X86TTIImpl::getGatherScatterOpCost(), llvm::TargetTransformInfoImplCRTPBase< AMDGPUTTIImpl >::getGEPCost(), llvm::GetElementPtrInst::getGEPReturnType(), llvm::ConstantExpr::getGetElementPtr(), llvm::GVNExpression::VariableExpression::getHashValue(), llvm::GVNExpression::ConstantExpression::getHashValue(), GetHeapSROAValue(), llvm::ConstantExpr::getICmp(), getIdentityValue(), getImplicitScaleFactor(), llvm::DataLayout::getIndexedOffsetInType(), getInductionVariable(), getInitializer(), llvm::getInlineCost(), llvm::ConstantExpr::getInsertElement(), llvm::ConstantExpr::getInsertValue(), llvm::TargetTransformInfoImplCRTPBase< AMDGPUTTIImpl >::getInstructionLatency(), llvm::ConstantExpr::getIntegerCast(), getIntrinsicForMaskedAtomicRMWBinOp(), llvm::ConstantExpr::getIntToPtr(), llvm::SCEVExpander::getIVIncOperand(), llvm::TargetLoweringObjectFile::getKindForGlobal(), llvm::InvokeInst::getLandingPadInst(), llvm::MemoryDependenceResults::getLoadLoadClobberFullWidthSize(), llvm::VNCoercion::getLoadValueForLoad(), GetLoopInvariantInsertPosition(), llvm::getMallocType(), getMaskedTypeForICmpPair(), getMaxPointerSize(), getMemCmpLoad(), llvm::VNCoercion::getMemInstValueForLoadHelper(), getMemSetPatternValue(), getMetadataTypeOrder(), getMinimumFPType(), llvm::GlobalsAAResult::getModRefBehavior(), llvm::AAResults::getModRefInfo(), getMulHu(), getName(), getNarrowIntrinsic(), getNaturalGEPWithOffset(), getNaturalGEPWithType(), llvm::ConstantExpr::getNeg(), getNewICmpValue(), llvm::DOTGraphTraits< BoUpSLP * >::getNodeAttributes(), llvm::MemoryDependenceResults::getNonLocalPointerDependency(), getNoopInput(), llvm::ConstantExpr::getNot(), getNumBytes(), llvm::ConstantAggregateZero::getNumElements(), llvm::ConstantDataSequential::getNumElements(), llvm::UndefValue::getNumElements(), getOffsetFromIndices(), getOpenCLAlignment(), getOptimizationFlags(), llvm::AArch64TTIImpl::getOrCreateResultFromMemIntrinsic(), llvm::InnerLoopVectorizer::getOrCreateTripCount(), llvm::InnerLoopVectorizer::getOrCreateVectorTripCount(), llvm::InnerLoopVectorizer::getOrCreateVectorValue(), llvm::getOrderedReduction(), llvm::getOrEnforceKnownAlignment(), getOrInsertValueProfilingCall(), llvm::Argument::getParamAlignment(), getParameterABIAttributes(), getParentPad(), llvm::AtomicCmpXchgInst::getPointerAddressSpace(), llvm::AtomicRMWInst::getPointerAddressSpace(), llvm::PtrToIntInst::getPointerAddressSpace(), getPointerAlignment(), llvm::GetPointerBaseWithConstantOffset(), llvm::ConstantExpr::getPointerBitCastOrAddrSpaceCast(), llvm::ConstantExpr::getPointerCast(), getPointerDereferenceableBytes(), GetPointerOperand(), getPointerOperands(), llvm::LoadInst::getPointerOperandType(), llvm::StoreInst::getPointerOperandType(), llvm::GEPOperator::getPointerOperandType(), llvm::PtrToIntOperator::getPointerOperandType(), llvm::GetElementPtrInst::getPointerOperandType(), getPow(), llvm::LazyValueInfo::getPredicateAt(), llvm::getPtrStride(), llvm::ConstantExpr::getPtrToInt(), getRangeForAffineARHelper(), getReducedType(), getReductionIntrinsic(), llvm::FastISel::getRegForGEPIndex(), llvm::FastISel::getRegForValue(), getRelevantOperands(), getRetComponentType(), GetRMWLibcall(), llvm::getSafeVectorConstantForBinop(), getScalarIntrinsicDeclaration(), getScalarizationOverhead(), llvm::ScalarEvolution::getSCEV(), llvm::ConstantExpr::getSelect(), getSelectFoldableConstant(), llvm::ConstantAggregateZero::getSequentialElement(), llvm::UndefValue::getSequentialElement(), llvm::ConstantExpr::getSExt(), llvm::ConstantExpr::getSExtOrBitCast(), llvm::ShuffleVectorInst::getShuffleMask(), llvm::getShuffleReduction(), llvm::ConstantExpr::getShuffleVector(), getSignature(), llvm::ARMTargetLowering::getSingleConstraintMatchWeight(), llvm::SystemZTargetLowering::getSingleConstraintMatchWeight(), llvm::PPCTargetLowering::getSingleConstraintMatchWeight(), llvm::X86TargetLowering::getSingleConstraintMatchWeight(), llvm::TargetLowering::getSingleConstraintMatchWeight(), llvm::ConstantExpr::getSIToFP(), llvm::MipsCCState::getSpecialCallingConvForCallee(), llvm::ConstantVector::getSplat(), llvm::ConstantDataVector::getSplat(), llvm::getSplatValue(), llvm::Constant::getSplatValue(), getSqrtCall(), llvm::AddrSpaceCastInst::getSrcAddressSpace(), llvm::BitCastOperator::getSrcTy(), llvm::SelectionDAG::getSrcValue(), llvm::InnerLoopVectorizer::getStepVector(), llvm::getStrideFromPointer(), llvm::GetStringLength(), llvm::ConstantAggregateZero::getStructElement(), llvm::UndefValue::getStructElement(), getSuccPad(), getTargetConstantBitsFromNode(), llvm::RISCVTargetLowering::getTgtMemIntrinsic(), llvm::HexagonTargetLowering::getTgtMemIntrinsic(), llvm::SITargetLowering::getTgtMemIntrinsic(), llvm::AArch64TargetLowering::getTgtMemIntrinsic(), llvm::NVPTXTargetLowering::getTgtMemIntrinsic(), llvm::ARMTargetLowering::getTgtMemIntrinsic(), llvm::X86TargetLowering::getTgtMemIntrinsic(), llvm::slpvectorizer::BoUpSLP::getTreeCost(), getTrueOrFalseValue(), llvm::ConstantExpr::getTrunc(), llvm::ConstantExpr::getTruncOrBitCast(), llvm::InlineAsm::getType(), llvm::AllocaInst::getType(), llvm::ConstantInt::getType(), llvm::GlobalValue::getType(), llvm::ValueAsMetadata::getType(), llvm::ConstantArray::getType(), llvm::ConstantStruct::getType(), llvm::ConstantVector::getType(), llvm::ConstantPointerNull::getType(), llvm::ConstantDataSequential::getType(), llvm::ConstantDataArray::getType(), llvm::ConstantDataVector::getType(), llvm::InsertElementInst::getType(), llvm::ShuffleVectorInst::getType(), llvm::ConstantStruct::getTypeForElements(), getTypePartition(), llvm::ConstantExpr::getUIToFP(), getUnderlyingArgReg(), llvm::GetUnderlyingObject(), getUnderlyingObjectFromInt(), llvm::getUnderlyingObjectsForCodeGen(), getUniformBase(), llvm::getUniqueCastUse(), llvm::PPCTTIImpl::getUserCost(), llvm::X86TTIImpl::getUserCost(), llvm::TargetTransformInfoImplCRTPBase< AMDGPUTTIImpl >::getUserCost(), llvm::SelectionDAGBuilder::getValue(), getValueFromICmpCondition(), llvm::SelectionDAGBuilder::getValueImpl(), getVectorCallCost(), llvm::slpvectorizer::BoUpSLP::getVectorElementSize(), getVectorIntrinsicCost(), llvm::ConstantExpr::getWithOperandReplaced(), llvm::ConstantExpr::getWithOperands(), getX86MaskVec(), llvm::ConstantExpr::getZExt(), llvm::ConstantExpr::getZExtOrBitCast(), llvm::GlobalVariable::GlobalVariable(), GlobalWasGeneratedByCompiler(), GreaterThanTypeSize(), HandleByValArgument(), HandleByValArgumentInit(), llvm::SelectionDAGBuilder::handleDebugValue(), llvm::ValueAsMetadata::handleDeletion(), handleMemIntrinsicPtrUse(), llvm::Constant::handleOperandChange(), llvm::ValueAsMetadata::handleRAUW(), llvm::Argument::hasByValAttr(), llvm::Argument::hasByValOrInAllocaAttr(), llvm::PHINode::hasConstantOrUndefValue(), llvm::Constant::hasExactInverseFP(), llvm::Argument::hasInAllocaAttr(), llvm::Argument::hasNestAttr(), llvm::Argument::hasNoAliasAttr(), llvm::Argument::hasNoCaptureAttr(), llvm::Argument::hasNonNullAttr(), hasOnlyOneNonZeroIndex(), hasOnlySelectUsers(), hasPositiveOperands(), hasProfileData(), hasSameArgumentList(), hasSameExtUse(), hasStoreUsersOnly(), llvm::Argument::hasStructRetAttr(), hasUndefContents(), hasValueBeenRAUWed(), hasZeroSignBit(), llvm::haveNoCommonBitsSet(), llvm::SCEVExpander::hoistIVInc(), HoistThenElseCodeToIf(), llvm::CompositeType::indexValid(), INITIALIZE_PASS(), llvm::MIRParserImpl::initializeConstantPool(), llvm::ExecutionEngine::InitializeMemory(), llvm::FunctionLoweringInfo::InitializeRegForValue(), llvm::InlineFunction(), llvm::RuntimePointerChecking::insert(), insertInteger(), insertLifetimeMarkersSurroundingCall(), InsertRootInitializers(), insertSinCosCall(), insertUniqueBackedgeBlock(), insertVector(), instrumentMaskedLoadOrStore(), llvm::MemoryDependenceResults::invalidateCachedPointerInfo(), inversePermutation(), isAligned(), isAlwaysFoldable(), isAtomic(), isBroadcastShuffle(), llvm::isBytewiseValue(), isCallPromotable(), llvm::LandingPadInst::isCatch(), isCompatibleIVType(), isCompatibleReplacement(), llvm::ShuffleVectorInst::isConcat(), llvm::isConsecutiveAccess(), llvm::RISCVELFTargetObjectFile::isConstantInSmallSection(), llvm::LanaiTargetObjectFile::isConstantInSmallSection(), llvm::MipsTargetObjectFile::IsConstantInSmallSection(), isConstantIntVector(), isContiguous(), llvm::isDereferenceableAndAlignedPointer(), isDivZero(), llvm::TargetLoweringBase::isExtFree(), llvm::TargetLoweringBase::isExtLoad(), llvm::ShuffleVectorInst::isExtractSubvectorMask(), llvm::LandingPadInst::isFilter(), llvm::Constant::isFiniteNonZeroFP(), llvm::SystemZTTIImpl::isFoldableLoad(), llvm::InductionDescriptor::isFPInductionPHI(), llvm::IsFreeToInvert(), isFuncOrArgAttr(), isGEPFoldable(), isGEPKnownNonNull(), isHighCostExpansion(), llvm::Instruction::isIdenticalToWhenDefined(), llvm::ShuffleVectorInst::isIdentityMask(), isIgnorableInst(), isImageOrSamplerVal(), llvm::isImpliedByDomCondition(), llvm::isImpliedCondition(), llvm::CmpInst::isImpliedFalseByMatchingCmp(), IsIncrementNUW(), isIndirectBrTarget(), llvm::InductionDescriptor::isInductionPHI(), llvm::CastInst::isIntegerCast(), isIntegerLoopHeaderPHI(), IsInterestingCmp(), isInterestingPointer(), isIntExtFree(), llvm::isKnownNeverNaN(), isKnownNonEqual(), isKnownNonNullFromDominatingCondition(), isKnownNonZero(), isKnownToBeAPowerOfTwo(), isKnownTypeIdMember(), llvm::isLegalToPromote(), isLoadConditional(), isLoadInvariantInLoop(), llvm::CastInst::isLosslessCast(), llvm::isMathLibCallNoop(), isMinMaxWithLoads(), isMulPowOf2(), llvm::Constant::isNaN(), llvm::Constant::isNegativeZeroValue(), IsNonLocalValue(), llvm::CastInst::isNoopCast(), llvm::Constant::isNormalFP(), llvm::Constant::isNotMinSignedValue(), isNoWrap(), IsNullTerminatedString(), isObjectDereferencedInBlock(), isObjectSize(), isOnlyReachableViaThisEdge(), isPointerOperand(), isPointerValueDeadOnEntryToFunction(), llvm::objcarc::IsPotentialRetainableObjPtr(), isProfitableChain(), llvm::AArch64TargetLowering::isProfitableToHoist(), isPromotedInstructionLegal(), isReInterleaveMask(), isRepeatedByteSequence(), isReportingError(), llvm::ShuffleVectorInst::isReverseMask(), isSafeAndProfitableToSinkLoad(), isSafeToEliminateVarargsCast(), llvm::isSafeToLoadUnconditionally(), llvm::Instruction::isSameOperationAs(), isSelect01(), llvm::ShuffleVectorInst::isSelectMask(), isSExtLoad(), isShuffleEquivalentToSelect(), isShuffleExtractingFromLHS(), isSimpleEnoughPointerToCommit(), isSimpleEnoughValueToCommitHelper(), isSimpleIVUser(), llvm::ShuffleVectorInst::isSingleSourceMask(), isSource(), isStrideMul(), llvm::ConstantDataSequential::isString(), isSupportedType(), llvm::ShuffleVectorInst::isTransposeMask(), isTruePredicate(), isUndefShift(), llvm::LoopVectorizationLegality::isUniform(), llvm::LoopAccessInfo::isUniform(), llvm::DemandedBits::isUseDead(), llvm::ExtractElementInst::isValidOperands(), llvm::InsertElementInst::isValidOperands(), llvm::ShuffleVectorInst::isValidOperands(), isVectorReductionOp(), isZero(), llvm::ShuffleVectorInst::isZeroEltSplatMask(), llvm::AArch64TargetLowering::isZExtFree(), LessOrEqualTypeSize(), LessThanTypeSize(), likeBitCastFromVector(), LinearizeExprTree(), LLVMBuildCall(), LLVMBuildGEP(), LLVMBuildInBoundsGEP(), LLVMBuildInvoke(), LLVMBuildLoad(), LLVMBuildStructGEP(), LLVMConstGEP(), LLVMConstInBoundsGEP(), LLVMConstRealGetDouble(), llvm::LoadAndStorePromoter::LoadAndStorePromoter(), llvm::LoadInst::LoadInst(), llvm::log2(), lookThroughCast(), llvm::WebAssemblyMCInstLower::lower(), llvm::SelectionDAGBuilder::LowerAsSTATEPOINT(), LowerAtomicCmpXchgInst(), LowerAtomicRMWInst(), LowerBSWAP(), llvm::FastISel::lowerCall(), llvm::SelectionDAGBuilder::LowerCallSiteWithDeoptBundle(), llvm::SelectionDAGBuilder::LowerCallSiteWithDeoptBundleImpl(), llvm::FastISel::lowerCallTo(), llvm::SelectionDAGBuilder::LowerCallTo(), llvm::AsmPrinter::lowerConstant(), LowerCTLZ(), LowerCTPOP(), llvm::AMDGPUCallLowering::lowerFormalArguments(), llvm::AArch64TargetLowering::lowerInterleavedStore(), llvm::ARMTargetLowering::lowerInterleavedStore(), llvm::IntrinsicLowering::LowerIntrinsicCall(), LowerNegateToMultiply(), llvm::lowerObjectSizeCall(), llvm::X86CallLowering::lowerReturn(), llvm::AMDGPUCallLowering::lowerReturn(), llvm::AArch64CallLowering::lowerReturn(), llvm::MipsCallLowering::lowerReturn(), LowerRotate(), llvm::SelectionDAGBuilder::LowerStatepoint(), lowerStatepointMetaArgs(), llvm::IntrinsicLowering::LowerToByteSwap(), llvm::MachineMemOperand::MachineMemOperand(), llvm::MachinePointerInfo::MachinePointerInfo(), makeBitReverse(), makeStatepointExplicitImpl(), mapBinOpcode(), llvm::SparseSolver< LatticeKey, LatticeVal, KeyInfo >::MarkBlockExecutable(), MarkBlocksLiveIn(), matchesOr(), matchPairwiseReductionAtLevel(), MatchReductions(), matchRotate(), llvm::matchSelectPattern(), matchSelectWithOptionalNotCond(), matchUAddWithOverflowConstantEdgeCases(), matchVectorSplittingReduction(), llvm::gvn::AvailableValue::MaterializeAdjustedValue(), llvm::gvn::AvailableValueInBlock::MaterializeAdjustedValue(), maybePrintCallAddrSpace(), maybePrintComdat(), maybeSetDSOLocal(), mayLoopAccessLocation(), mayUsePostIncMode(), llvm::LoopVectorizationCostModel::memoryInstructionCanBeWidened(), MergeAliasResults(), llvm::MergeBasicBlockIntoOnlyPred(), mergeConditionalStoreToAddress(), mergeEmptyReturnBlocks(), MightBeFoldableInst(), llvm::TargetTransformInfoImplBase::minRequiredElementSize(), moveUp(), MulWillOverflow(), llvm::InstDeleterIRStrategy::mutate(), narrowUDivURem(), narrowVectorSelect(), needsFPFromSig(), NegateValue(), llvm::RandomIRBuilder::newSink(), llvm::RandomIRBuilder::newSource(), okayForPHIOfOps(), operandWithNewAddressSpaceOrCreateUndef(), operator new(), operator<<(), OptimizeAwayTrappingUsesOfValue(), optimizeBinaryDoubleFP(), optimizeDivRem(), optimizeDoubleFP(), OptimizeEmptyGlobalCXXDtors(), OptimizeExtractBits(), OptimizeGlobalAddressOfMalloc(), optimizeIntegerToVectorInsertions(), optimizeMemCmpConstantSize(), OptimizeNoopCopyExpression(), optimizeOnceStoredGlobal(), optimizeSQRT(), optimizeVectorResize(), llvm::InnerLoopVectorizer::packScalarIntoVectorValue(), llvm::TargetLowering::ParseConstraints(), patchAndReplaceAllUsesWith(), false::LibCallsShrinkWrap::perform(), performAtomicOp(), PerformHeapAllocSRoA(), performMaskedAtomicOp(), llvm::PHITransAddr::PHITranslateWithInsertion(), PhiTypeSorterFunc(), llvm::PointerMayBeCaptured(), llvm::AMDGPUAAResult::pointsToConstantMemory(), llvm::CallBase::populateBundleOperandInfos(), llvm::SelectionDAGBuilder::populateCallLoweringInfo(), possiblyDemandedEltsInMask(), llvm::ARMConstantPoolValue::print(), llvm::ScalarEvolution::print(), printAsOperandImpl(), processAShr(), processBinOp(), llvm::JumpThreadingPass::ProcessBranchOnXOR(), processCallSite(), processInternalGlobal(), processOverflowIntrinsic(), processPHI(), processSDiv(), processSelect(), processSRem(), processUDivOrURem(), processUGT_ADDCST_ADD(), processUMulZExtIdiom(), llvm::promoteCall(), promotedOpIsNUW(), llvm::promoteLoopAccessesToScalars(), promoteSingleBlockAlloca(), PropagateConstantsIntoArguments(), propagateMetadata(), propagateNaN(), readWideAPInt(), llvm::recognizeBSwapOrBitReverseIdiom(), ReduceSwitchRange(), llvm::DemandedBitsWrapperPass::releaseMemory(), llvm::removeAllNonTerminatorAndEHPadInstructions(), removeBitcastsFromLoadStoreOnMinMax(), llvm::SwitchInst::removeCase(), RemoveDeadConstant(), removeGlobalCtors(), llvm::CatchSwitchInst::removeHandler(), RemoveInstInputs(), llvm::MemoryDependenceResults::removeInstruction(), removeLifetimeIntrinsicUsers(), llvm::replaceAllDbgUsesWith(), replaceAllUsesOfWithIn(), llvm::SCEVExpander::replaceCongruentIVs(), llvm::replaceDbgUsesWithUndef(), replaceDominatedUsesWith(), llvm::InstCombiner::replacedSelectWithOperand(), ReplaceFoldableUses(), ReplaceFPIntrinsicWithCall(), llvm::InstCombiner::replaceInstUsesWith(), llvm::replaceNonLocalUsesWith(), llvm::replaceSymbolicStrideSCEV(), replaceUnaryCall(), ReplaceUsesOfWith(), replaceUsesOutsideBlock(), replaceWithConstant(), reportLoadElim(), reportMayClobberedLoad(), llvm::Record::resolveReferences(), RetagMask(), llvm::returnTypeIsEligibleForTailCall(), reuseTableCompare(), llvm::InnerLoopVectorizer::reverseVector(), RewriteHeapSROALoadUser(), rewritePHIs(), rewriteSingleStoreAlloca(), RewriteUsesOfClonedInstructions(), llvm::LoopDataPrefetchPass::run(), llvm::LoadAndStorePromoter::run(), llvm::WholeProgramDevirtPass::run(), llvm::InstCombiner::run(), llvm::runIPSCCP(), llvm::RewriteStatepointsForGC::runOnFunction(), runPartiallyInlineLibCalls(), runSCCP(), scalarConstantToHexString(), scalarizeBinOpOfBuildVectors(), llvm::InnerLoopVectorizer::scalarizeInstruction(), scalarizeMaskedCompressStore(), scalarizeMaskedExpandLoad(), scalarizeMaskedGather(), scalarizeMaskedLoad(), scalarizeMaskedScatter(), scalarizeMaskedStore(), llvm::FastISel::selectBinaryOp(), llvm::FastISel::selectBitCast(), llvm::FastISel::selectCast(), llvm::FastISel::selectExtractValue(), llvm::FastISel::selectFNeg(), llvm::FastISel::selectIntrinsicCall(), llvm::FastISel::selectOperator(), llvm::FastISel::selectPatchpoint(), llvm::FastISel::selectStackmap(), llvm::GlobalAlias::setAliasee(), llvm::LoadInst::setAlignment(), llvm::StoreInst::setAlignment(), llvm::CallSiteBase< Function, BasicBlock, Value, User, Use, Instruction, CallInst, InvokeInst, CallBrInst, User::op_iterator >::setCalledFunction(), llvm::CallBase::setCalledFunction(), llvm::LoopVectorizationCostModel::setCostBasedWideningDecision(), llvm::MemIntrinsicBase< AnyMemIntrinsic >::setDest(), llvm::AtomicMemIntrinsic::setElementSizeInBytes(), llvm::PHINode::setIncomingValue(), llvm::GlobalVariable::setInitializer(), llvm::MemIntrinsicBase< AnyMemIntrinsic >::setLength(), setLimitsForSelectPattern(), llvm::MemTransferBase< AnyMemIntrinsic >::setSource(), llvm::MemSetBase< AnyMemIntrinsic >::setValue(), shorter_filter(), llvm::AArch64TTIImpl::shouldConsiderAddressTypePromotion(), shouldConvertImpl(), llvm::HexagonTargetLowering::shouldExpandAtomicCmpXchgInIR(), llvm::HexagonTargetLowering::shouldExpandAtomicLoadInIR(), llvm::AArch64TargetLowering::shouldExpandAtomicLoadInIR(), llvm::ARMTargetLowering::shouldExpandAtomicLoadInIR(), llvm::SparcTargetLowering::shouldExpandAtomicRMWInIR(), llvm::SITargetLowering::shouldExpandAtomicRMWInIR(), llvm::AArch64TargetLowering::shouldExpandAtomicRMWInIR(), llvm::ARMTargetLowering::shouldExpandAtomicRMWInIR(), llvm::HexagonTargetLowering::shouldExpandAtomicStoreInIR(), llvm::AArch64TargetLowering::shouldExpandAtomicStoreInIR(), llvm::ARMTargetLowering::shouldExpandAtomicStoreInIR(), shouldFixMainFunction(), shouldInstrumentReadWriteFromAddress(), shouldKeepFDivF32(), shouldMergeGEPs(), shouldPromote(), llvm::AArch64TargetLowering::shouldSinkOperands(), llvm::ARMTargetLowering::shouldSinkOperands(), ShrinkDemandedConstant(), shrinkFPConstant(), shrinkInsertElt(), shrinkSplatShuffle(), SimplifyAddInst(), simplifyAllocaArraySize(), SimplifyAndInst(), simplifyAndOfICmpsWithAdd(), simplifyAndOfICmpsWithSameOperands(), simplifyAndOrOfCmps(), simplifyAndOrOfFCmps(), simplifyAndOrOfICmpsWithConstants(), SimplifyAShrInst(), simplifyAssocCastAssoc(), simplifyBinaryIntrinsic(), SimplifyBranchOnICmpChain(), SimplifyBSwap(), SimplifyCall(), SimplifyCastInst(), simplifyDiv(), simplifyDivRem(), llvm::InstCombiner::simplifyDivRemOfSelectWithZeroOp(), SimplifyExtractElementInst(), SimplifyFAddInst(), SimplifyFDivInst(), SimplifyFMulInst(), simplifyFPBinop(), SimplifyFRemInst(), SimplifyFSubInst(), SimplifyGEPInst(), SimplifyICmpInst(), simplifyICmpOfBools(), simplifyICmpWithBinOp(), llvm::SimplifyInsertElementInst(), SimplifyInsertValueInst(), llvm::SimplifyInstruction(), simplifyInvariantGroupIntrinsic(), SimplifyLShrInst(), simplifyMaskedLoad(), SimplifyMulInst(), simplifyNeonTbl1(), simplifyNeonVld1(), SimplifyNVVMIntrinsic(), SimplifyOrInst(), simplifyOrOfICmpsWithAdd(), simplifyOrOfICmpsWithSameOperands(), llvm::JumpThreadingPass::SimplifyPartiallyRedundantLoad(), SimplifyPHINode(), simplifyRelocatesOffABase(), simplifyRem(), SimplifyRightShift(), SimplifySDivInst(), SimplifyShift(), SimplifyShlInst(), SimplifyShuffleVectorInst(), SimplifySRemInst(), SimplifySubInst(), simplifyUnsignedRangeCheck(), simplifyX86addcarry(), simplifyX86insertps(), simplifyX86MaskedLoad(), simplifyX86MaskedStore(), simplifyX86movmsk(), simplifyX86pack(), simplifyX86pshufb(), simplifyX86round(), simplifyX86varShift(), simplifyX86vpermilvar(), simplifyX86vpermv(), SimplifyXorInst(), sink(), SinkCast(), SinkShiftAndTruncate(), AllocaSlices::SliceBuilder::SliceBuilder(), llvm::InstCombiner::SliceUpIllegalIntegerPHI(), llvm::sortPtrAccesses(), speculatePHINodeLoads(), speculateSelectInstLoads(), splitCallSite(), llvm::SplitLandingPadPredecessors(), splitMergedValStore(), stripAndAccumulateInBoundsConstantOffsets(), stripAndComputeConstantOffsets(), stripNonValidDataFromBody(), llvm::SubOne(), supportedAddressingMode(), swapMayExposeCSEOpportunities(), switchToSelect(), ThreadCmpOverSelect(), transformToIndexedCompare(), truncateIVUse(), llvm::InnerLoopVectorizer::truncateToMinimalBitwidths(), tryPromoteAllocaToVector(), tryToElideArgumentCopy(), tryToOptimizeStoreOfMallocToGlobal(), tryToReplaceWithConstant(), tryToShorten(), TryToShrinkGlobalToBoolean(), TryToSinkInstruction(), llvm::JumpThreadingPass::TryToUnfoldSelectInCurrBB(), tryToVectorizeHorReductionOrInstOperands(), tryUnmergingGEPsAcrossIndirectBr(), TurnSwitchRangeIntoICmp(), TypeSizeToSizeIndex(), UnpackFromArgumentSlot(), unpackLoadToAggregate(), unpackStoreToAggregate(), llvm::UnreachableInst::UnreachableInst(), llvm::UnrollRuntimeLoopRemainder(), updateOperand(), UpdatePHINodes(), llvm::SelectionDAGBuilder::UpdateSplitBlock(), upgradeAbs(), upgradeAVX512MaskToSelect(), llvm::UpgradeBitCastExpr(), llvm::UpgradeBitCastInst(), UpgradeIntrinsicFunction1(), upgradeMaskedCompare(), UpgradeMaskedLoad(), UpgradeMaskedStore(), UpgradeMaskToInt(), upgradePMULDQ(), UpgradeX86AddSubSatIntrinsics(), UpgradeX86ALIGNIntrinsics(), upgradeX86ConcatShift(), UpgradeX86PSLLDQIntrinsics(), UpgradeX86PSRLDQIntrinsics(), upgradeX86Rotate(), upgradeX86vpcom(), UpgradeX86VPERMT2Intrinsics(), llvm::AMDGPULibCalls::useNative(), valueHasFloatPrecision(), llvm::ValueHandleBase::ValueIsDeleted(), llvm::ValueHandleBase::ValueIsRAUWd(), llvm::InnerLoopVectorizer::vectorizeInterleaveGroup(), llvm::slpvectorizer::BoUpSLP::vectorizeTree(), verifyAddrSpace(), versionCallSite(), llvm::sroa::AllocaSliceRewriter::visit(), llvm::InstCombiner::visitAdd(), llvm::InstCombiner::visitAddrSpaceCast(), llvm::Interpreter::visitAllocaInst(), llvm::InstCombiner::visitAllocaInst(), llvm::InstCombiner::visitAllocSite(), llvm::InstCombiner::visitAnd(), llvm::ObjectSizeOffsetVisitor::visitArgument(), llvm::Interpreter::visitAShr(), llvm::InstCombiner::visitAShr(), llvm::InstCombiner::visitAtomicRMWInst(), llvm::Interpreter::visitBinaryOperator(), llvm::InstCombiner::visitBitCast(), llvm::Interpreter::visitBitCastInst(), llvm::SelectionDAGBuilder::visitBitTestCase(), llvm::InstCombiner::visitBranchInst(), llvm::InstCombiner::visitCallInst(), llvm::Interpreter::visitExtractElementInst(), llvm::InstCombiner::visitExtractElementInst(), llvm::Interpreter::visitExtractValueInst(), llvm::InstCombiner::visitExtractValueInst(), llvm::InstCombiner::visitFAdd(), llvm::Interpreter::visitFCmpInst(), llvm::InstCombiner::visitFCmpInst(), llvm::InstCombiner::visitFDiv(), llvm::Interpreter::visitFPExtInst(), llvm::Interpreter::visitFPToSIInst(), llvm::Interpreter::visitFPToUIInst(), llvm::InstCombiner::visitFPTrunc(), llvm::Interpreter::visitFPTruncInst(), llvm::InstCombiner::visitFSub(), llvm::InstCombiner::visitGetElementPtrInst(), VisitGlobalVariableForEmission(), llvm::Interpreter::visitICmpInst(), llvm::InstCombiner::visitICmpInst(), llvm::InstCombiner::visitInsertElementInst(), llvm::Interpreter::visitInsertValueInst(), llvm::InstCombiner::visitIntToPtr(), llvm::Interpreter::visitIntToPtrInst(), visitIVCast(), llvm::InstCombiner::visitLandingPadInst(), llvm::Interpreter::visitLoadInst(), llvm::InstCombiner::visitLoadInst(), llvm::Interpreter::visitLShr(), llvm::InstCombiner::visitLShr(), llvm::InstCombiner::visitMul(), llvm::InstCombiner::visitOr(), llvm::InstCombiner::visitPHINode(), llvm::PtrUseVisitor< SliceBuilder >::visitPtr(), llvm::InstCombiner::visitPtrToInt(), llvm::Interpreter::visitPtrToIntInst(), llvm::Interpreter::visitReturnInst(), llvm::InstCombiner::visitReturnInst(), llvm::InstCombiner::visitSDiv(), llvm::Interpreter::visitSelectInst(), llvm::InstCombiner::visitSExt(), llvm::Interpreter::visitSExtInst(), llvm::Interpreter::visitShl(), llvm::InstCombiner::visitShl(), llvm::InstCombiner::visitShuffleVectorInst(), llvm::Interpreter::visitSIToFPInst(), llvm::InstCombiner::visitSRem(), llvm::Interpreter::visitStoreInst(), llvm::InstCombiner::visitStoreInst(), llvm::InstCombiner::visitSub(), llvm::Interpreter::visitSwitchInst(), llvm::InstCombiner::visitTrunc(), llvm::Interpreter::visitTruncInst(), llvm::InstCombiner::visitUDiv(), llvm::Interpreter::visitUIToFPInst(), llvm::InstCombiner::visitURem(), llvm::Interpreter::visitVAArgInst(), llvm::InstCombiner::visitXor(), llvm::InstCombiner::visitZExt(), llvm::Interpreter::visitZExtInst(), llvm::InnerLoopVectorizer::widenIntOrFpInduction(), llvm::InnerLoopVectorizer::widenPHIInstruction(), wrapConstantAsMetadata(), WriteAsOperandInternal(), WriteConstantInternal(), X86ChooseCmpImmediateOpcode(), llvm::reassociate::XorOpnd::XorOpnd(), and llvm::BasicBlock::~BasicBlock(). there is no value with code InstructionVal (no opcode==0). there are more possible values for the value type than in ValueTy enum. Definition at line 463 of file Value.h. Referenced by alwaysAvailable(), llvm::GlobalIFunc::classof(), llvm::ConstantData::classof(), llvm::GlobalIndirectSymbol::classof(), llvm::GlobalAlias::classof(), llvm::Argument::classof(), llvm::Constant::classof(), llvm::MemoryAccess::classof(), llvm::GlobalObject::classof(), llvm::InlineAsm::classof(), llvm::MetadataAsValue::classof(), llvm::GlobalVariable::classof(), llvm::ConstantInt::classof(), llvm::MemoryUseOrDef::classof(), llvm::MemoryUse::classof(), llvm::ConstantFP::classof(), llvm::BasicBlock::classof(), llvm::ConstantAggregateZero::classof(), llvm::MemoryDef::classof(), llvm::ConstantAggregate::classof(), llvm::ConstantArray::classof(), llvm::ConstantStruct::classof(), llvm::ConstantVector::classof(), llvm::ConstantPointerNull::classof(), llvm::GlobalValue::classof(), llvm::MemoryPhi::classof(), llvm::Instruction::classof(), llvm::ConstantDataSequential::classof(), llvm::ConstantDataArray::classof(), llvm::Function::classof(), llvm::ConstantDataVector::classof(), llvm::ConstantTokenNone::classof(), llvm::BlockAddress::classof(), llvm::ConstantExpr::classof(), llvm::UndefValue::classof(), llvm::FunctionComparator::cmpConstants(), CompareValueComplexity(), deleteValue(), llvm::Constant::destroyConstant(), llvm::isa_impl< Constant, Value >::doit(), llvm::isa_impl< ConstantData, Value >::doit(), llvm::isa_impl< ConstantAggregate, Value >::doit(), llvm::isa_impl< Argument, Value >::doit(), llvm::isa_impl< InlineAsm, Value >::doit(), llvm::isa_impl< Instruction, Value >::doit(), llvm::isa_impl< BasicBlock, Value >::doit(), llvm::isa_impl< Function, Value >::doit(), llvm::isa_impl< GlobalVariable, Value >::doit(), llvm::isa_impl< GlobalAlias, Value >::doit(), llvm::isa_impl< GlobalIFunc, Value >::doit(), llvm::GlobalValue::eraseFromParent(), llvm::Constant::handleOperandChange(), and llvm::GlobalValue::removeFromParent(). Definition at line 186 of file Value.cpp. References assert(), getContext(), HasName, I, llvm::LLVMContext::pImpl, and llvm::LLVMContextImpl::ValueNames. Referenced by deleteValue(), llvm::TargetIntrinsicInfo::getIntrinsicID(), getName(), hasName(), takeName(), and llvm::ValueSymbolTable::~ValueSymbolTable(). Definition at line 250 of file Value.h. References assertModuleIsMaterializedImpl(), getName(), getValueName(), HasName, Name, llvm::No, replaceAllUsesWith(), replaceNonMetadataUsesWith(), replaceUsesOutsideBlock(), setName(), setValueName(), takeName(), and llvm::Yes. Referenced by AddAliasScopeMetadata(), asmClobbersCTR(), llvm::canConstantFoldCallTo(), llvm::CloneBasicBlock(), llvm::CloneFunction(), computeFunctionSummary(), llvm::ConstantFoldCall(), llvm::NVPTXAsmPrinter::doFinalization(), llvm::FunctionImportGlobalProcessing::doImportAsDefinition(), llvm::DomTreeUpdater::dump(), externalize(), llvm::foldBlockIntoPredecessor(), forEachUser(), FunctionNumber(), llvm::ModuleSummaryIndex::getGlobalValueSummary(), llvm::ExecutionEngine::getMangledName(), getName(), llvm::Mangler::getNameWithPrefix(), llvm::GetOrCreateFunctionComdat(), getParentPad(), GetPointerOperand(), llvm::getSamplerName(), llvm::getSurfaceName(), llvm::getTextureName(), initSlots2BasicBlocks(), insertIfNamed(), instrumentMaskedLoadOrStore(), llvm::TargetTransformInfoImplBase::isLoweredToCall(), makeStatepointExplicitImpl(), llvm::maybeMarkSanitizerLibraryCallNoBuiltin(), maybePrintCallAddrSpace(), maybePrintComdat(), llvm::MergeBlockIntoPredecessor(), false::operator<<(), OptimizeFunctions(), OptimizeGlobalAliases(), OptimizeGlobalVars(), llvm::LinkDiagnosticInfo::print(), llvm::ValueEnumerator::print(), llvm::AliasSet::print(), llvm::MemoryPhi::print(), llvm::MachineBasicBlock::print(), printIRBlockReference(), printIRValueReference(), printWithoutType(), llvm::ReplaceInstWithValue(), RetagMask(), llvm::FastISel::selectInstruction(), suffixed_name_or(), takeName(), and llvm::ValueSymbolTable::~ValueSymbolTable(). Definition at line 131 of file Value.cpp. References llvm::hasNItems(), use_begin(), and use_end(). Referenced by llvm::slpvectorizer::BoUpSLP::canMapToVector(), canonicalizeSaturatedAdd(), createRdxShuffleMask(), hasOneUse(), mergeConditionalStores(), SpeculativelyExecuteBB(), llvm::InstCombiner::visitFMul(), and llvm::InstCombiner::visitXor(). This is logically equivalent to getNumUses() >= N.
Definition at line 135 of file Value.cpp. References llvm::hasNItemsOrMore(), use_begin(), and use_end(). Referenced by canonicalizeSaturatedAdd(), hasMoreThanOneUseOtherThanLLVMUsed(), hasOneUse(), isBroadcastShuffle(), isLoopIncrement(), processUMulZExtIdiom(), llvm::BasicBlock::removePredecessor(), replaceConstantExprOp(), SRAGlobal(), llvm::InstCombiner::visitSub(), and llvm::InstCombiner::visitXor(). This is specialized because it is a common request and does not require traversing the whole use list. Definition at line 412 of file Value.h. References E, getNumUses(), hasNUses(), hasNUsesOrMore(), I, isUsedInBasicBlock(), N, use_begin(), and use_end(). Referenced by areInverseVectorBitmasks(), buildMultiplyTree(), canEvaluateShifted(), canEvaluateShuffled(), llvm::slpvectorizer::BoUpSLP::canMapToVector(), canNotEvaluateInType(), canonicalizeSaturatedAdd(), canonicalizeSaturatedSubtract(), canSinkInstructions(), canTransformAccumulatorRecursion(), CC_MipsO32_FP64(), cheapToScalarize(), checkForNegativeOperand(), llvm::collectCmpOps(), collectInsertionElements(), llvm::LoopVectorizationCostModel::collectInstsToScalarize(), collectValuesToDemote(), combineLoadToOperationType(), llvm::slpvectorizer::BoUpSLP::computeMinimumValueSizes(), ConvertToSInt(), createAndInstr(), createRdxShuffleMask(), DeadPHICycle(), decomposeSimpleLinearExpr(), despeculateCountZeros(), emitGlobalConstantImpl(), findBuildAggregate(), findBuildVector(), findInitTrampolineFromAlloca(), llvm::SelectionDAGBuilder::FindMergedConditions(), FindSingleUseIdentifiedObject(), foldAndToXor(), foldBitcastExtElt(), llvm::FoldBranchToCommonDest(), FoldCondBranchOnPHI(), foldICmpBitCast(), foldICmpShlOne(), foldICmpWithMinMax(), foldICmpWithTruncSignExtendedVal(), foldIdentityExtractShuffle(), foldInsSequenceIntoBroadcast(), foldNoWrapAdd(), foldOperationIntoPhiValue(), foldOperationIntoSelectOperand(), foldOrToXor(), foldSelectICmpAnd(), foldSelectICmpAndAnd(), foldSelectICmpAndOr(), foldSelectShuffle(), llvm::InstCombiner::FoldShiftByConstant(), foldSignedTruncationCheck(), foldVectorCmp(), foldVecTruncToExtElt(), foldXorToXor(), getBinOpsForFactorization(), llvm::AArch64TTIImpl::getCastInstrCost(), getCompareCC(), getComparePred(), llvm::SystemZTTIImpl::getMemoryOpCost(), getPow(), getRelevantOperands(), getSelectFoldableConstant(), getTypePartition(), llvm::HexagonTTIImpl::getUserCost(), hasSameExtUse(), llvm::FastISel::hasTrivialKill(), hasUseOtherThanLLVMUsed(), hasUsesOutsideLoop(), hasValueBeenRAUWed(), isAlwaysFoldable(), llvm::RecurrenceDescriptor::isConditionalRdxPattern(), llvm::TargetLoweringBase::isExtLoad(), llvm::RecurrenceDescriptor::isFirstOrderRecurrence(), llvm::SystemZTTIImpl::isFoldableLoad(), isFormingBranchFromSelectProfitable(), isGEPFoldable(), IsInterestingCmp(), isKnownTypeIdMember(), llvm::RecurrenceDescriptor::isMinMaxSelectCmpPattern(), isMulPowOf2(), isOnlyReachableViaThisEdge(), llvm::AArch64TargetLowering::isProfitableToHoist(), isPromotedInstructionLegal(), isReInterleaveMask(), isSafeAndProfitableToSinkLoad(), IsSafeComputationToRemove(), isSink(), LinearizeExprTree(), lookThroughAnd(), matchDeMorgansLaws(), matchUAddWithOverflowConstantEdgeCases(), narrowUDivURem(), OptimizeNoopCopyExpression(), llvm::InstCombiner::OptimizePointerDifference(), processUGT_ADDCST_ADD(), llvm::recognizeBSwapOrBitReverseIdiom(), removeEmptyCleanup(), replaceAllUsesOfWithIn(), replaceExtractElements(), llvm::InstCombiner::run(), shouldBeDeferred(), ShouldBreakUpSubtract(), shouldMergeGEPs(), ShrinkDemandedConstant(), SimplifyBSwap(), llvm::InstCombiner::simplifyDivRemOfSelectWithZeroOp(), SimplifyIndirectBrOnSelect(), simplifyValueKnownNonZero(), sinkAndCmp0Expression(), sinkNotIntoXor(), sinkSelectOperand(), llvm::InstCombiner::SliceUpIllegalIntegerPHI(), supportedAddressingMode(), transformToIndexedCompare(), llvm::FastISel::tryToFoldLoad(), TryToSinkInstruction(), llvm::JumpThreadingPass::TryToUnfoldSelect(), llvm::JumpThreadingPass::TryToUnfoldSelectInCurrBB(), llvm::InstCombiner::visitAdd(), llvm::InstCombiner::visitAnd(), llvm::InstCombiner::visitCallInst(), llvm::InstCombiner::visitExtractElementInst(), llvm::InstCombiner::visitFCmpInst(), llvm::InstCombiner::visitFDiv(), llvm::InstCombiner::visitFMul(), llvm::InstCombiner::visitFPTrunc(), llvm::InstCombiner::visitGetElementPtrInst(), llvm::InstCombiner::visitICmpInst(), llvm::InstCombiner::visitInsertValueInst(), llvm::InstCombiner::visitLoadInst(), llvm::InstCombiner::visitLShr(), visitMaskedMerge(), llvm::InstCombiner::visitMul(), llvm::InstCombiner::visitOr(), llvm::InstCombiner::visitPHINode(), llvm::InstCombiner::visitSExt(), llvm::InstCombiner::visitStoreInst(), llvm::InstCombiner::visitTrunc(), llvm::InstCombiner::visitXor(), and llvm::InstCombiner::visitZExt(). Definition at line 480 of file Value.h. Definition at line 485 of file Value.h. Referenced by findInitTrampoline(), llvm::MemorySSAUpdater::removeMemoryAccess(), and llvm::SSAUpdaterBulk::RewriteAllUses(). swifterror values can be either a function argument or an alloca with a swifterror attribute. Definition at line 730 of file Value.cpp. References Arg, assert(), llvm::DenseMapBase< DerivedT, KeyT, ValueT, KeyInfoT, BucketT >::begin(), llvm::dyn_cast(), E, llvm::DenseMapBase< DerivedT, KeyT, ValueT, KeyInfoT, BucketT >::end(), llvm::DenseMapBase< DerivedT, KeyT, ValueT, KeyInfoT, BucketT >::getPointerIntoBucketsArray(), I, llvm::DenseMapBase< DerivedT, KeyT, ValueT, KeyInfoT, BucketT >::isPointerIntoBucketsArray(), llvm::AllocaInst::isSwiftError(), List, llvm::DenseMapBase< DerivedT, KeyT, ValueT, KeyInfoT, BucketT >::size(), and llvm::LLVMContextImpl::ValueHandles. Referenced by llvm::AllocaInst::cloneImpl(), combineLoadToOperationType(), combineStoreToValueType(), llvm::createHWAddressSanitizerPass(), GlobalWasGeneratedByCompiler(), isAtomic(), isUsedByMetadata(), and removeBitcastsFromLoadStoreOnMinMax(). Definition at line 488 of file Value.h. References isSwiftError(), IsUsedByMD, and stripPointerCasts(). Referenced by contains(), llvm::FindDbgAddrUses(), llvm::findDbgUsers(), llvm::findDbgValues(), getStartOrEndSlot(), llvm::hoistAllInstructionsInto(), llvm::replaceAllDbgUsesWith(), and ~Value(). Definition at line 139 of file Value.cpp. References llvm::BasicBlock::begin(), llvm::dyn_cast(), llvm::BasicBlock::end(), llvm::is_contained(), user_begin(), and user_end(). Referenced by FindAllMemoryUses(), and hasOneUse(). Definition at line 334 of file Value.h. Referenced by materialized_uses(), and use_begin(). Definition at line 335 of file Value.h. Definition at line 327 of file Value.h. Definition at line 371 of file Value.h. Referenced by materialized_users(), user_back(), and user_begin(). Definition at line 372 of file Value.h. Definition at line 393 of file Value.h. References llvm::make_range(), materialized_user_begin(), and user_end(). Referenced by forEachUser(), and users(). Definition at line 396 of file Value.h. Definition at line 348 of file Value.h. References llvm::make_range(), materialized_use_begin(), and use_end(). Referenced by readWideAPInt(), and uses(). Definition at line 351 of file Value.h. Note that this is an extremely dangerous operation which can create completely invalid IR very easily. It is strongly recommended that you recreate IR objects with the right types instead of mutating them in place. Definition at line 603 of file Value.h. References llvm::MCID::Compare, reverseUseList(), and sortUseList(). Referenced by getNarrowIntrinsic(), isCallPromotable(), llvm::CallBase::mutateFunctionType(), operator<<(), replaceAllUsesOfWithIn(), and wrapConstantAsMetadata(). Definition at line 4211 of file AsmWriter.cpp. References getModuleFromVal(), isReferencingMDNode(), and print(). Referenced by llvm::MIRPrinter::convert(), createCast(), llvm::createMemDepPrinter(), ensurePromotedGV(), isCallPromotable(), llvm::operator<<(), llvm::ValueEnumerator::print(), llvm::AccelTableBase::HashData::print(), print(), llvm::AliasSet::print(), llvm::InstCombiner::run(), scaleCaseProbality(), shouldConvert(), and llvm::VerifierSupport::VerifierSupport(). Definition at line 4222 of file AsmWriter.cpp. References F(), llvm::ModuleSlotTracker::getMachine(), getModuleFromVal(), llvm::Instruction::getParent(), llvm::BasicBlock::getParent(), llvm::GlobalValue::getParent(), llvm::ModuleSlotTracker::incorporateFunction(), llvm_unreachable, print(), llvm::RISCVFenceField::W, and WriteConstantInternal(). This is useful when you just want to print 'int reg126', not the instruction that generated it. If you specify a Module for context, then even constanst get pretty-printed; for example, the type of a null pointer is printed symbolically. Definition at line 4288 of file AsmWriter.cpp. References getModuleFromVal(), Machine, printAsOperandImpl(), and printWithoutType(). Referenced by llvm::DiagnosticInfoOptimizationBase::Argument::Argument(), llvm::MIRPrinter::convert(), ConvertDoubleToBytes(), llvm::createMemDepPrinter(), llvm::GVNExpression::Expression::dump(), llvm::ScheduleDAGInstrs::Value2SUsMap::dump(), llvm::AsmPrinter::EmitDebugValue(), llvm::AsmPrinter::EmitGlobalVariable(), llvm::LazyValueInfo::enableDT(), llvm::VPlan::execute(), llvm::DOTGraphTraits< const Function * >::getCompleteNodeLabel(), llvm::DOTGraphTraits< const Function * >::getSimpleNodeLabel(), llvm::AsmPrinter::lowerConstant(), mayUsePostIncMode(), patchAndReplaceAllUsesWith(), llvm::IVUsers::print(), llvm::SCEV::print(), llvm::AliasSet::print(), llvm::MachineOperand::print(), llvm::MachineMemOperand::print(), llvm::MemoryPhi::print(), llvm::VPBlendRecipe::print(), llvm::VPInterleaveRecipe::print(), llvm::VPWidenMemoryInstructionRecipe::print(), llvm::ScalarEvolution::print(), llvm::GVNExpression::BasicExpression::printInternal(), llvm::GVNExpression::CallExpression::printInternal(), llvm::GVNExpression::LoadExpression::printInternal(), llvm::GVNExpression::StoreExpression::printInternal(), printIRValueReference(), llvm::printLoop(), PrintModRefResults(), PrintResults(), reportLoadElim(), reportMayClobberedLoad(), setFastFlags(), SinkInstruction(), and llvm::VerifierSupport::VerifierSupport(). Definition at line 4303 of file AsmWriter.cpp. References llvm::ModuleSlotTracker::getMachine(), llvm::ModuleSlotTracker::getModule(), printAsOperandImpl(), and printWithoutType(). Go through the uses list for this definition and make each use point to "V" instead of "this". After this completes, 'this's use list is guaranteed to be empty. Definition at line 429 of file Value.cpp. Referenced by AddReachableCodeToWorklist(), llvm::MemorySSAUpdater::applyInsertUpdates(), atomicSizeSupported(), buildClonedLoopBlocks(), buildMultiplyTree(), llvm::DomTreeUpdater::callbackDeleteBB(), canCreateAliasFor(), canCreateThunkFor(), changeToCall(), llvm::changeToInvokeAndSplitBasicBlock(), CleanupConstantGlobalUsers(), llvm::CloneAndPruneIntoFromInst(), CloneLoop(), collectFunctionUsers(), combineLoadToOperationType(), ComputePostOrders(), ConvertShiftToMul(), llvm::convertToDeclaration(), ConvertToSInt(), createCallInst(), createClone(), llvm::createCodeGenPreparePass(), llvm::createDeadArgHackingPass(), CreateGCRelocates(), llvm::createObjCARCOptPass(), createOrdering(), createResumeEntryBlock(), llvm::createScalarizerPass(), llvm::createSeparateConstOffsetFromGEPPass(), llvm::createShadowStackGCLoweringPass(), cse(), deleteDeadInstruction(), llvm::DemotePHIToStack(), despeculateCountZeros(), llvm::DetatchDeadBlocks(), doPromotion(), llvm::GVNExpression::Expression::dump(), llvm::EliminateDuplicatePHINodes(), eraseDeadBBsAndChildren(), llvm::objcarc::EraseInstruction(), llvm::expandAtomicRMWToCmpXchg(), llvm::expandDivision(), llvm::expandDivisionUpTo32Bits(), llvm::expandDivisionUpTo64Bits(), llvm::expandRemainder(), llvm::expandRemainderUpTo32Bits(), llvm::expandRemainderUpTo64Bits(), llvm::CodeExtractor::findInputsOutputs(), findPHIToPartitionLoops(), llvm::SanitizerStatReport::finish(), llvm::InnerLoopVectorizer::fixFirstOrderRecurrence(), foldAnyOrAllBitsSet(), llvm::foldBlockIntoPredecessor(), foldGuardedRotateToFunnelShift(), FoldTwoEntryPHINode(), FunctionNumber(), getChainID(), llvm::VNCoercion::getLoadValueForLoad(), GetLoopInvariantInsertPosition(), getMulHu(), getNarrowIntrinsic(), getOrInsertValueProfilingCall(), GetPointerOperand(), getPow(), getReducedType(), getRetComponentType(), GetRMWLibcall(), getScalarIntrinsicDeclaration(), getSignature(), getStartOrEndSlot(), getTrueOrFalseValue(), handleNoSuspendCoroutine(), llvm::Constant::handleOperandChange(), hasName(), hasProfileData(), hasSameExtUse(), hasZeroSignBit(), llvm::hoistRegion(), HoistThenElseCodeToIf(), INITIALIZE_PASS(), llvm::InlineFunction(), InsertRootInitializers(), instrumentMaskedLoadOrStore(), isAlwaysFoldable(), isCallPromotable(), isKnownTypeIdMember(), isOnlyReachableViaThisEdge(), llvm::log2(), LowerAtomicCmpXchgInst(), LowerAtomicRMWInst(), lowerExpectIntrinsic(), llvm::IntrinsicLowering::LowerIntrinsicCall(), lowerLoadRelative(), LowerRotate(), lowerSubFn(), llvm::IntrinsicLowering::LowerToByteSwap(), makeBitReverse(), mapBinOpcode(), MarkBlocksLiveIn(), maybeSetDSOLocal(), llvm::MergeBasicBlockIntoOnlyPred(), llvm::MergeBlockIntoPredecessor(), mergeCleanupPad(), mergeEmptyReturnBlocks(), mergeInlinedArrayAllocas(), llvm::InstDeleterIRStrategy::mutate(), operator<<(), llvm::LibCallSimplifier::optimizeCall(), optimizeDivRem(), OptimizeEmptyGlobalCXXDtors(), llvm::slpvectorizer::BoUpSLP::optimizeGatherSequence(), OptimizeGlobalAddressOfMalloc(), OptimizeGlobalAliases(), optimizeMemCmpConstantSize(), OptimizeNoopCopyExpression(), optimizeSQRT(), patchAndReplaceAllUsesWith(), performMaskedAtomicOp(), processAShr(), llvm::JumpThreadingPass::ProcessBranchOnXOR(), processCmp(), processInternalGlobal(), processOverflowIntrinsic(), processPHI(), processSDiv(), processSelect(), processSRem(), processUDivOrURem(), promotedOpIsNUW(), promoteSingleBlockAlloca(), PropagateConstantReturn(), PropagateConstantsIntoArguments(), PushArgMD(), llvm::removeAllNonTerminatorAndEHPadInstructions(), removeCoroEnds(), removeGlobalCtors(), llvm::PHINode::removeIncomingValue(), llvm::BasicBlock::removePredecessor(), llvm::removeUnwindEdge(), replace(), replaceAliasWithAliasee(), replaceAndRecursivelySimplifyImpl(), llvm::AMDGPULibCalls::replaceCall(), ReplaceCallWith(), llvm::SCEVExpander::replaceCongruentIVs(), llvm::replaceCreatedSSACopys(), replaceFrameSize(), llvm::InstCombiner::replaceInstUsesWith(), llvm::ReplaceInstWithValue(), ReplaceUsesOfWith(), reportLoadElim(), reportMayClobberedLoad(), llvm::BitcodeReaderValueList::resolveConstantForwardRefs(), reuseTableCompare(), RewriteHeapSROALoadUser(), rewritePHINodesForExitAndUnswitchedBlocks(), rewritePHIs(), rewriteSingleStoreAlloca(), llvm::LoadAndStorePromoter::run(), llvm::WholeProgramDevirtPass::run(), llvm::InstCombiner::run(), runImpl(), llvm::runIPSCCP(), scalarizeMaskedExpandLoad(), scalarizeMaskedGather(), scalarizeMaskedLoad(), shouldFixMainFunction(), shouldKeepFDivF32(), simplifyAndDCEInstruction(), simplifyCommonValuePhi(), SimplifyIndirectBrOnSelect(), llvm::simplifyLoopAfterUnroll(), simplifyOneLoop(), llvm::JumpThreadingPass::SimplifyPartiallyRedundantLoad(), simplifyRelocatesOffABase(), simplifySuspendPoint(), sink(), speculatePHINodeLoads(), speculateSelectInstLoads(), splitCallSite(), splitGlobal(), llvm::SplitLandingPadPredecessors(), SRAGlobal(), StackMallocSizeClass(), truncateIVUse(), llvm::InnerLoopVectorizer::truncateToMinimalBitwidths(), tryCSEWithPredecessor(), tryPromoteAllocaToVector(), tryToOptimizeStoreOfMallocToGlobal(), tryToReplaceWithConstant(), TryToShrinkGlobalToBoolean(), llvm::TryToSimplifyUncondBranchFromEmptyBlock(), llvm::JumpThreadingPass::TryToUnfoldSelectInCurrBB(), llvm::UnrollAndJamLoop(), llvm::AMDGPULibCalls::useNative(), llvm::slpvectorizer::BoUpSLP::vectorizeTree(), llvm::sroa::AllocaSliceRewriter::visit(), llvm::ObjectSizeOffsetEvaluator::visitPHINode(), and llvm::BasicBlock::~BasicBlock(). Go through the uses list for this definition and make each use point to "V" instead of "this". This function skips metadata entries in the list. replaceUsesOutsideBlock - Go through the uses list for this definition and make each use point to "V" instead of "this" when the use is outside the block. 'This's use list is expected to have at least one element. Unlike replaceAllUsesWith this function does not support basic block values or constant users. References assert(), contains(), llvm::dyn_cast(), E, getType(), llvm::Use::getUser(), llvm::Use::set(), use_begin(), and use_end(). Referenced by createFFSIntrinsic(), hasName(), and llvm::InstCombiner::replacedSelectWithOperand(). Definition at line 711 of file Value.cpp. Choose a new unique name if the provided name is taken. Name The new name; or "" if the value's name should be removed. Definition at line 285 of file Value.cpp. Referenced by llvm::GetElementPtrInst::accumulateConstantOffset(), llvm::AllocaInst::AllocaInst(), llvm::Argument::Argument(), llvm::BinaryOperator::BinaryOperator(), buildMultiplyTree(), llvm::CloneBasicBlock(), llvm::CloneFunction(), cloneInstForMustTail(), CloneInstructionInExitBlock(), llvm::CloneModule(), llvm::CmpInst::CmpInst(), llvm::LandingPadInst::Create(), llvm::CallBrInst::Create(), llvm::CallInst::CreateFree(), createMemMoveLoop(), llvm::InnerLoopVectorizer::createVectorizedLoopSkeleton(), createWrapper(), llvm::FunctionImportGlobalProcessing::doImportAsDefinition(), doPromotion(), llvm::JumpThreadingPass::DuplicateCondBranchOnPHIIntoPred(), llvm::DuplicateInstructionsInSplitBetween(), eliminateRecursiveTailCall(), llvm::InnerLoopVectorizer::emitMemRuntimeChecks(), llvm::InnerLoopVectorizer::emitSCEVChecks(), externalize(), llvm::FenceInst::FenceInst(), findInitTrampoline(), llvm::CodeExtractor::findInputsOutputs(), llvm::InnerLoopVectorizer::fixupIVUsers(), llvm::foldBlockIntoPredecessor(), llvm::FoldBranchToCommonDest(), FoldCondBranchOnPHI(), forceRenaming(), FunctionNumber(), generateUnsignedDivisionCode(), llvm::BasicBlock::getContext(), llvm::InvokeInst::getLandingPadInst(), hasName(), INITIALIZE_PASS(), llvm::IRBuilderDefaultInserter::InsertHelper(), instrumentMaskedLoadOrStore(), isAlwaysFoldable(), llvm::ShuffleVectorInst::isConcat(), isKnownTypeIdMember(), isOnlyReachableViaThisEdge(), isSupportedGuardInstruction(), llvm::ExtractElementInst::isValidOperands(), llvm::LoadInst::LoadInst(), llvm::IntrinsicLowering::LowerIntrinsicCall(), llvm::makeGuardControlFlowExplicit(), makeStatepointExplicitImpl(), mayLoopAccessLocation(), NegateValue(), llvm::peelLoop(), false::LibCallsShrinkWrap::perform(), llvm::CallBase::populateBundleOperandInfos(), rematerializeLiveValues(), llvm::CatchSwitchInst::removeHandler(), rename(), ReplaceCallWith(), RetagMask(), rewriteComdat(), rewriteMaterializableInstructions(), llvm::WholeProgramDevirtPass::run(), llvm::InnerLoopVectorizer::scalarizeInstruction(), selectJumpTableArmEncoding(), shouldFixMainFunction(), shouldRotateLoopExitingLatch(), llvm::ShuffleVectorInst::ShuffleVectorInst(), sinkInstruction(), splitBlockIfNotFirst(), llvm::SplitLandingPadPredecessors(), StripSymtab(), SwitchToLookupTable(), takeName(), llvm::JumpThreadingPass::ThreadEdge(), turnGuardIntoBranch(), TypeSizeToSizeIndex(), llvm::UnaryOperator::UnaryOperator(), unpackLoadToAggregate(), llvm::UnrollRuntimeLoopRemainder(), llvm::VAArgInst::VAArgInst(), versionCallSite(), llvm::LoopVersioning::versionLoop(), llvm::InnerLoopVectorizer::widenIntOrFpInduction(), and llvm::InnerLoopVectorizer::widenPHIInstruction(). Definition at line 197 of file Value.cpp. References assert(), getContext(), HasName, llvm::LLVMContext::pImpl, and llvm::LLVMContextImpl::ValueNames. Referenced by deleteValue(), getName(), hasName(), rewriteComdat(), takeName(), and llvm::ValueSymbolTable::~ValueSymbolTable(). Definition at line 655 of file Value.h. Referenced by llvm::Function::classof(), llvm::ConstantExpr::classof(), computeAddrSpace(), llvm::ConstantExpr::ConstantExpr(), llvm::Function::dropAllReferences(), llvm::BasicBlock::getLandingPadInst(), llvm::CmpInst::makeCmpResultType(), llvm::Function::setPrologueData(), llvm::Function::stealArgumentListFrom(), and llvm::Function::~Function(). Sorts the Value's use-list by Cmp using a stable mergesort. Cmp is expected to compare two Use references. Definition at line 686 of file Value.h. Referenced by FunctionNumber(), mutateType(), and readWideAPInt(). Stores the resulting constant offset stripped into the APInt provided. The provided APInt will be extended or truncated as needed to be the correct bitwidth for an offset of this pointer type. If this is called on a non-pointer value, it returns 'this'. Definition at line 547 of file Value.cpp. References assert(), GEP, llvm::APInt::getBitWidth(), llvm::DataLayout::getIndexSizeInBits(), llvm::Operator::getOpcode(), getType(), llvm::SmallPtrSetImpl< PtrType >::insert(), and llvm::Type::isPointerTy(). Referenced by llvm::GlobalIndirectSymbol::getBaseObject(), llvm::isConsecutiveAccess(), propagateMetadata(), stripAndAccumulateInBoundsConstantOffsets(), stripInBoundsConstantOffsets(), and llvm::InstCombiner::visitGetElementPtrInst(). Definition at line 547 of file Value.h. Returns the original pointer value. If this is called on a non-pointer value, it returns 'this'. Definition at line 537 of file Value.cpp. Referenced by FixedPointIntrinsicToOpcode(), llvm::CodeExtractor::isLegalToShrinkwrapLifetimeMarkers(), llvm::FastISel::selectIntrinsicCall(), stripInBoundsConstantOffsets(), and stripPointerCastsNoFollowAliases(). Definition at line 533 of file Value.h. Definition at line 589 of file Value.cpp. Referenced by llvm::GlobalIndirectSymbol::getBaseObject(), getSuccPad(), getTypePartition(), shouldInstrumentReadWriteFromAddress(), stripAndAccumulateInBoundsConstantOffsets(), stripInBoundsOffsets(), and llvm::sroa::AllocaSliceRewriter::visit(). Definition at line 558 of file Value.h. References DoPHITranslation(), getPointerAlignment(), getPointerDereferenceableBytes(), and stripInBoundsOffsets(). Returns the original uncasted value. If this is called on a non-pointer value, it returns 'this'. Definition at line 529 of file Value.cpp. Referenced by llvm::MachineFunction::addLandingPad(), llvm::classifyEHPersonality(), llvm::ObjectSizeOffsetVisitor::compute(), llvm::ObjectSizeOffsetEvaluator::compute(), computePointerICmp(), ConvertDoubleToBytes(), llvm::emitBinaryFloatFnCall(), llvm::emitCalloc(), llvm::emitFGetCUnlocked(), llvm::emitFGetSUnlocked(), llvm::emitFPutC(), llvm::emitFPutCUnlocked(), llvm::emitFPutS(), llvm::emitFPutSUnlocked(), llvm::emitFReadUnlocked(), llvm::emitFWrite(), llvm::emitFWriteUnlocked(), llvm::emitMalloc(), llvm::emitMemChr(), emitMemCmpOrBcmp(), llvm::emitMemCpyChk(), llvm::emitPutChar(), llvm::emitPutS(), llvm::AsmPrinter::EmitSpecialLLVMGlobal(), llvm::emitStrChr(), llvm::emitStrCpy(), llvm::emitStrLen(), llvm::emitStrNCmp(), llvm::emitStrNCpy(), emitUnaryFloatFnCallHelper(), enforceKnownAlignment(), llvm::objcarc::EraseInstruction(), llvm::Evaluator::EvaluateBlock(), llvm::AlignmentFromAssumptionsPass::extractAlignmentInfo(), llvm::ExtractTypeInfo(), findArgumentCopyElisionCandidates(), llvm::FindAvailablePtrLoadStore(), findBasePointer(), llvm::findDevirtualizableCallsForTypeTest(), findInitTrampoline(), findInitTrampolineFromAlloca(), findSafeStoreForStoreStrongContraction(), findUsedValues(), FixedPointIntrinsicToOpcode(), getCalledFunction(), llvm::AbstractCallSite::getCalledFunction(), llvm::getConstantDataArrayInfo(), llvm::MemIntrinsicBase< AnyMemIntrinsic >::getDest(), llvm::TargetTransformInfoImplCRTPBase< AMDGPUTTIImpl >::getGEPCost(), llvm::MemoryDependenceResults::getInvariantGroupPointerDependency(), getKnownConstant(), llvm::InstrProfIncrementInst::getName(), llvm::InstrProfValueProfileInst::getName(), getOpenCLAlignment(), getParentPad(), llvm::LazyValueInfo::getPredicateAt(), llvm::CoroIdInst::getPromise(), llvm::objcarc::GetRCIdentityRoot(), llvm::objcarc::getreturnRVOperand(), llvm::MemTransferBase< AnyMemIntrinsic >::getSource(), GetStringLengthH(), getSuccPad(), getSuccState(), hasNoAliasAttr(), hasUndefContents(), llvm::InlineFunction(), InsertRootInitializers(), isKnownNonConstant(), isObjectSizeLessThanOrEq(), isOverwrite(), IsPointerOffset(), llvm::isSafeToLoadUnconditionally(), isUsedByMetadata(), isZero(), llvm::BlockAddress::lookup(), moveUp(), OptimizeEmptyGlobalCXXDtors(), optimizeOnceStoredGlobal(), llvm::JumpThreadingPass::ProcessBlock(), removePartiallyOverlappedStores(), llvm::WholeProgramDevirtPass::run(), llvm::FastISel::selectPatchpoint(), shouldFixMainFunction(), llvm::Constant::stripPointerCasts(), stripPointerCasts(), transformToIndexedCompare(), tryToMoveFreeBeforeNullTest(), llvm::InnerLoopVectorizer::vectorizeInterleaveGroup(), llvm::InstCombiner::visitGetElementPtrInst(), and llvm::InstCombiner::visitLandingPadInst(). Definition at line 501 of file Value.h. Returns the original uncasted value. If this is called on a non-pointer value, it returns 'this'. This function should be used only in Alias analysis. Definition at line 541 of file Value.cpp. Referenced by aliasSameBasePointerGEPs(), MergeAliasResults(), stripPointerCasts(), and stripPointerCastsAndInvariantGroups(). Definition at line 513 of file Value.h. Definition at line 533 of file Value.cpp. Referenced by compareNames(), FindUsedValues(), llvm::StackSafetyInfo::FunctionInfo::FunctionInfo(), INITIALIZE_PASS(), stripPointerCastsAndInvariantGroups(), and stripPointerCastsNoFollowAliases(). Definition at line 523 of file Value.h. After taking V's name, sets V's name to empty. It is an error to call V->takeName(V). Definition at line 291 of file Value.cpp. References assert(), getSymTab(), getValueName(), hasName(), setName(), llvm::StringMapEntry< ValueTy >::setValue(), setValueName(), and llvm::ARM_MB::ST.
Referenced by buildClonedLoopBlocks(), canCreateAliasFor(), canCreateThunkFor(), changeToCall(), ConvertShiftToMul(), llvm::convertToDeclaration(), ConvertToSInt(), llvm::createDeadArgHackingPass(), llvm::createScalarizerPass(), llvm::createSeparateConstOffsetFromGEPPass(), llvm::createShadowStackGCLoweringPass(), decomposeSimpleLinearExpr(), doPromotion(), eliminateRecursiveTailCall(), findInitTrampoline(), llvm::FoldBranchToCommonDest(), foldICmpBitCast(), foldICmpWithMinMax(), foldOperationIntoPhiValue(), llvm::InstCombiner::FoldShiftByConstant(), foldShiftedShift(), FoldTwoEntryPHINode(), forceRenaming(), getBinOpsForFactorization(), llvm::VNCoercion::getLoadValueForLoad(), getMinVisibility(), getReducedType(), getRetComponentType(), getScalarIntrinsicDeclaration(), getSignature(), getTrueOrFalseValue(), HandleInlinedEHPad(), hasName(), HoistThenElseCodeToIf(), INITIALIZE_PASS(), llvm::InlineFunction(), InsertRootInitializers(), instrumentMaskedLoadOrStore(), isGEPFoldable(), isKnownTypeIdMember(), isSelect01(), isZeroLengthArray(), LowerNegateToMultiply(), llvm::MergeBlockIntoPredecessor(), OptimizeGlobalAliases(), removeGlobalCtors(), llvm::removeUnwindEdge(), replaceAliasWithAliasee(), llvm::ReplaceInstWithValue(), replaceUnaryCall(), reportLoadElim(), reportMayClobberedLoad(), rewritePHIs(), setUsedInitializer(), shouldKeepFDivF32(), ShrinkDemandedConstant(), simplifyAllocaArraySize(), simplifyAssocCastAssoc(), SimplifyBSwap(), llvm::JumpThreadingPass::SimplifyPartiallyRedundantLoad(), simplifyRelocatesOffABase(), llvm::InnerLoopVectorizer::truncateToMinimalBitwidths(), TryToShrinkGlobalToBoolean(), unifyBitWidth(), llvm::InstCombiner::visitAnd(), llvm::InstCombiner::visitCallInst(), llvm::InstCombiner::visitGetElementPtrInst(), llvm::InstCombiner::visitOr(), llvm::InstCombiner::visitTrunc(), and llvm::InstCombiner::visitXor(). Definition at line 338 of file Value.h. Referenced by llvm::MemorySSAUpdater::applyInsertUpdates(), createCallInst(), getNumUses(), getSignature(), hasNUses(), hasNUsesOrMore(), hasOneUse(), INITIALIZE_PASS(), llvm::MemorySSAUpdater::insertDef(), isDirectCall(), isEligibleForMerging(), isMulPowOf2(), LLVMGetFirstUse(), lookThroughAnd(), lowerLoadRelative(), lowerObjCCall(), OptimizeGlobalAddressOfMalloc(), predictValueUseListOrder(), llvm::ValueEnumerator::print(), llvm::MemorySSAUpdater::removeMemoryAccess(), replaceDominatedUsesWith(), replaceLoopInvariantUses(), llvm::replaceNonLocalUsesWith(), replaceUsesOutsideBlock(), RetagMask(), RewriteUsesOfClonedInstructions(), llvm::WholeProgramDevirtPass::run(), llvm::InstCombiner::run(), and sinkInstruction(). Definition at line 342 of file Value.h. Definition at line 322 of file Value.h. Referenced by AddReachableCodeToWorklist(), llvm::attributesPermitTailCall(), buildMultiplyTree(), llvm::DomTreeUpdater::callbackDeleteBB(), canCreateAliasFor(), combineLoadToOperationType(), ComputePostOrders(), containsProfilingIntrinsics(), ConvertToSInt(), llvm::SelectionDAGBuilder::CopyToExportRegsIfNeeded(), llvm::createDeadArgHackingPass(), llvm::createDwarfEHPass(), llvm::createObjCARCOptPass(), createRetPHINode(), DCEInstruction(), DeadPHICycle(), deleteDeadInstruction(), deleteIfDead(), llvm::DemotePHIToStack(), llvm::DemoteRegToStack(), despeculateCountZeros(), llvm::Constant::destroyConstant(), llvm::DetatchDeadBlocks(), llvm::NVPTXAsmPrinter::doFinalization(), llvm::AsmPrinter::doFinalization(), doPromotion(), llvm::LLVMContextImpl::dropTriviallyDeadConstantArrays(), llvm::InstCombiner::eraseInstFromFunction(), llvm::objcarc::EraseInstruction(), findInitTrampoline(), FixedPointIntrinsicToOpcode(), FunctionNumber(), llvm::lto::LTO::getMaxTasks(), getMinVisibility(), getRetComponentType(), getScalarIntrinsicDeclaration(), getSignature(), hasAddressTakenAndUsed(), hasProfileData(), hasSameExtUse(), hasUseOtherThanLLVMUsed(), hasUsesOutsideLoop(), llvm::hoistRegion(), llvm::InlineFunction(), isAlwaysFoldable(), isBroadcastShuffle(), isDirectCall(), llvm::isInstructionTriviallyDead(), isLoadInvariantInLoop(), IsNonLocalValue(), isOnlyReachableViaThisEdge(), isOnlyUsedInEntryBlock(), isPromotedInstructionLegal(), isReportingError(), isSafeToEliminateVarargsCast(), isSafeToPromoteArgument(), isUsedOutsideOfDefiningBlock(), LinearizeExprTree(), llvm::AMDGPUCallLowering::lowerFormalArguments(), llvm::IntrinsicLowering::LowerIntrinsicCall(), lowerLoadRelative(), lowerObjCCall(), LowerRotate(), makeStatepointExplicitImpl(), MarkBlocksLiveIn(), mergeConstants(), llvm::AliasSet::mergeSetIn(), mustPreserveGV(), OptimizeAwayTrappingUsesOfLoads(), OptimizeExtractBits(), OptimizeGlobalAddressOfMalloc(), optimizeGlobalsInModule(), passingValueIsAlwaysUndefined(), patchAndReplaceAllUsesWith(), false::LibCallsShrinkWrap::perform(), performMaskedAtomicOp(), llvm::SelectionDAGBuilder::populateCallLoweringInfo(), predictValueUseListOrder(), processInternalGlobal(), llvm::promoteLoopAccessesToScalars(), promoteSingleBlockAlloca(), PropagateConstantsIntoArguments(), propagateMetadata(), llvm::RecursivelyDeleteTriviallyDeadInstructions(), llvm::StatepointLoweringState::relocCallVisited(), llvm::removeAllNonTerminatorAndEHPadInstructions(), RemoveDeadConstant(), llvm::LazyCallGraph::removeDeadFunction(), removeDeadUsersOfConstant(), removeEmptyCleanup(), llvm::MemorySSA::removeFromLookups(), removeGlobalCtors(), llvm::MemorySSAUpdater::removeMemoryAccess(), ReplaceCallWith(), ReplaceFoldableUses(), llvm::InstCombiner::replaceInstUsesWith(), llvm::LazyCallGraph::RefSCC::replaceNodeFunction(), RewriteUsesOfClonedInstructions(), RewriteUsesOfLoadForHeapSRoA(), llvm::GlobalDCEPass::run(), llvm::InlinerPass::run(), llvm::LoadAndStorePromoter::run(), llvm::WholeProgramDevirtPass::run(), llvm::InstCombiner::run(), runImpl(), llvm::JumpThreadingPass::runImpl(), llvm::runIPSCCP(), llvm::StatepointLoweringState::scheduleRelocCall(), llvm::FastISel::selectIntrinsicCall(), llvm::FastISel::CallLoweringInfo::setCallee(), llvm::TargetLowering::CallLoweringInfo::setCallee(), simplifyAndDCEInstruction(), llvm::InstCombiner::simplifyDivRemOfSelectWithZeroOp(), SinkCast(), sinkCmpExpression(), AllocaSlices::SliceBuilder::SliceBuilder(), speculatePHINodeLoads(), speculateSelectInstLoads(), splitCallSite(), splitGlobal(), splitGlobals(), llvm::SplitLandingPadPredecessors(), SRAGlobal(), llvm::Function::stealArgumentListFrom(), stripDeadPrototypes(), StripSymbolNames(), llvm::InnerLoopVectorizer::truncateToMinimalBitwidths(), TryToShrinkGlobalToBoolean(), updateOperand(), useFuncSeen(), llvm::InstCombiner::visitAtomicRMWInst(), llvm::PtrUseVisitor< SliceBuilder >::visitGetElementPtrInst(), llvm::VPReplicateRecipe::VPReplicateRecipe(), llvm::BasicBlock::~BasicBlock(), and ~Value(). Definition at line 346 of file Value.h. Referenced by createCallInst(), getNumUses(), getSignature(), hasNUses(), hasNUsesOrMore(), hasOneUse(), INITIALIZE_PASS(), llvm::MemorySSAUpdater::insertDef(), isDirectCall(), isEligibleForMerging(), LLVMGetFirstUse(), lowerLoadRelative(), lowerObjCCall(), materialized_uses(), predictValueUseListOrder(), replaceDominatedUsesWith(), replaceLoopInvariantUses(), llvm::replaceNonLocalUsesWith(), replaceUsesOutsideBlock(), RetagMask(), RewriteUsesOfClonedInstructions(), llvm::WholeProgramDevirtPass::run(), and sinkInstruction(). Definition at line 347 of file Value.h. Definition at line 385 of file Value.h. Referenced by llvm::slpvectorizer::BoUpSLP::computeMinimumValueSizes(), llvm::Constant::destroyConstant(), doPromotion(), emitGlobalConstantImpl(), findInitTrampolineFromAlloca(), getRetComponentType(), OptimizeGlobalAddressOfMalloc(), removeDeadUsersOfConstant(), llvm::runIPSCCP(), SRAGlobal(), StripSymbolNames(), TryToShrinkGlobalToBoolean(), llvm::InstCombiner::visitInsertValueInst(), and llvm::BasicBlock::~BasicBlock(). Definition at line 389 of file Value.h. Definition at line 375 of file Value.h. Referenced by addAllGlobalValueUsers(), areAllUsesEqual(), llvm::slpvectorizer::BoUpSLP::canMapToVector(), canPaddingBeAccessed(), canSinkInstructions(), canTransformToMemCmp(), llvm::GraphTraits< Inverse< MemoryAccess * > >::child_begin(), CleanupConstantGlobalUsers(), CleanupPointerRootUsers(), combineLoadToOperationType(), ConstantPropUsersOf(), ConvertToSInt(), llvm::ScalarEvolution::delinearize(), llvm::CodeExtractor::findInputsOutputs(), foldOperationIntoPhiValue(), llvm::AArch64TTIImpl::getCastInstrCost(), llvm::getMallocType(), llvm::SystemZTTIImpl::getMemoryOpCost(), getOutliningPenalty(), getTypePartition(), llvm::AliasSet::getUniqueInstruction(), hasProfileData(), hasSameExtUse(), llvm::FastISel::hasTrivialKill(), hasUsesOutsideLoop(), INITIALIZE_PASS(), llvm::isAllocaPromotable(), llvm::SystemZTTIImpl::isFoldableLoad(), isIgnorableInst(), isKnownTypeIdMember(), llvm::RecurrenceDescriptor::isMinMaxSelectCmpPattern(), isPromotedInstructionLegal(), isReInterleaveMask(), isSink(), isUsedInBasicBlock(), isZeroLengthArray(), LinearizeExprTree(), MarkBlocksLiveIn(), moveUp(), operator new(), OptimizeAwayTrappingUsesOfLoads(), OptimizeAwayTrappingUsesOfValue(), OptimizeEmptyGlobalCXXDtors(), OptimizeExtractBits(), passingValueIsAlwaysUndefined(), PerformHeapAllocSRoA(), processUMulZExtIdiom(), promoteSingleBlockAlloca(), llvm::Constant::removeDeadConstantUsers(), removeLifetimeIntrinsicUsers(), replaceAllUsesOfWithIn(), replaceConstantExprOp(), llvm::BitcodeReaderValueList::resolveConstantForwardRefs(), RewriteHeapSROALoadUser(), rewriteSingleStoreAlloca(), RewriteUsesOfLoadForHeapSRoA(), llvm::InstCombiner::run(), sink(), sinkAndCmp0Expression(), SinkCast(), sinkCmpExpression(), sinkLastInstruction(), SinkShiftAndTruncate(), supportedAddressingMode(), llvm::UpgradeCallsToIntrinsic(), and llvm::PredicateInfo::~PredicateInfo(). Definition at line 379 of file Value.h. Definition at line 363 of file Value.h. Referenced by canSinkInstructions(), llvm::AliasSet::getUniqueInstruction(), hasUsesOutsideLoop(), INITIALIZE_PASS(), isValidCandidateForColdCC(), and sinkLastInstruction(). Definition at line 383 of file Value.h. Referenced by addAllGlobalValueUsers(), areAllUsesEqual(), llvm::slpvectorizer::BoUpSLP::canMapToVector(), canPaddingBeAccessed(), canTransformToMemCmp(), llvm::GraphTraits< Inverse< MemoryAccess * > >::child_end(), CleanupConstantGlobalUsers(), CleanupPointerRootUsers(), combineLoadToOperationType(), ConstantPropUsersOf(), llvm::ScalarEvolution::delinearize(), llvm::CodeExtractor::findInputsOutputs(), foldOperationIntoPhiValue(), llvm::getMallocType(), llvm::AliasSet::getUniqueInstruction(), hasProfileData(), INITIALIZE_PASS(), llvm::isAllocaPromotable(), isReInterleaveMask(), isUsedInBasicBlock(), isZeroLengthArray(), MarkBlocksLiveIn(), materialized_users(), moveUp(), operator new(), OptimizeAwayTrappingUsesOfLoads(), OptimizeAwayTrappingUsesOfValue(), OptimizeEmptyGlobalCXXDtors(), OptimizeExtractBits(), PerformHeapAllocSRoA(), processUMulZExtIdiom(), promoteSingleBlockAlloca(), llvm::Constant::removeDeadConstantUsers(), removeLifetimeIntrinsicUsers(), replaceAllUsesOfWithIn(), replaceConstantExprOp(), RewriteHeapSROALoadUser(), rewriteSingleStoreAlloca(), RewriteUsesOfLoadForHeapSRoA(), sink(), sinkAndCmp0Expression(), SinkCast(), sinkCmpExpression(), SinkShiftAndTruncate(), llvm::UpgradeCallsToIntrinsic(), and llvm::PredicateInfo::~PredicateInfo(). Definition at line 384 of file Value.h. Definition at line 399 of file Value.h. Referenced by addAllGlobalValueUsers(), addNoRecurseAttrsTopDown(), llvm::InstCombineWorklist::AddUsersToWorkList(), allCallersPassInValidPointerForArgument(), AllGlobalLoadUsesSimpleEnoughForHeapSRA(), allNonInstructionUsersCanBeMadeInstructions(), allUsersAreInFunction(), AllUsesOfLoadedValueWillTrapIfNull(), AllUsesOfValueWillTrapIfNull(), AlmostDeadIV(), alwaysAvailable(), llvm::MemorySSAUpdater::applyInsertUpdates(), BlockIsSimpleEnoughToThreadThrough(), buildMultiplyTree(), llvm::calculateClrEHStateNumbers(), calculateCXXStateNumbers(), calculateSEHStateNumbers(), llvm::LoopVectorizationLegality::canFoldTailByMasking(), llvm::slpvectorizer::BoUpSLP::canMapToVector(), canonicalizeSaturatedAdd(), llvm::canTrackGlobalVariableInterprocedurally(), llvm::ARMTargetLowering::CCAssignFnForReturn(), ChangeCalleesToFastCall(), changeCallSitesToColdCC(), cheapToScalarize(), clearAssumptionsOfUsers(), llvm::CloneAndPruneIntoFromInst(), cloneConstantExprWithNewAddressSpace(), collectCallers(), collectFunctionUsers(), combineLoadToOperationType(), completeEphemeralValues(), ComputePostOrders(), ConvertToSInt(), createCallInst(), createCast(), llvm::createCodeGenPreparePass(), llvm::createObjCARCOptPass(), createRetBitCast(), createRetPHINode(), detectPopcountIdiom(), detectShiftUntilZeroIdiom(), llvm::InstCombiner::dominatesAllUses(), doPromotion(), llvm::LazyValueInfo::enableDT(), eraseDeadBBsAndChildren(), llvm::CodeExtractor::findAllocas(), llvm::FindDbgAddrUses(), llvm::findDbgUsers(), llvm::findDbgValues(), findInitTrampoline(), findInitTrampolineFromAlloca(), findInnerReductionPhi(), llvm::CodeExtractor::findInputsOutputs(), FindSingleUseIdentifiedObject(), llvm::InnerLoopVectorizer::fixupIVUsers(), foldOperationIntoPhiValue(), getCleanupRetUnwindDest(), getFirstNonAllocaInTheEntryBlock(), GetLoopInvariantInsertPosition(), llvm::HexagonTargetObjectFile::getLutUsedFunction(), llvm::GlobalsAAResult::getModRefBehavior(), getModuleFromVal(), llvm::DOTGraphTraits< BoUpSLP * >::getNodeAttributes(), getNumGlobalVariableUses(), getParentPad(), getPreferredExtendForValue(), getRangeForAffineARHelper(), getRelevantOperands(), llvm::StatepointBase< Function, Instruction, Value, CallBase >::getRelocates(), getSignature(), getTypePartition(), llvm::getUniqueCastUse(), getUnwindDestToken(), getUnwindDestTokenHelper(), GlobalUsersSafeToSRA(), hasBranchUse(), hasChangeableCC(), hasExceptionPointerOrCodeUser(), hasLifetimeMarkers(), hasOnlySelectUsers(), llvm::hasOutsideLoopUser(), hasProfileData(), hasSameExtUse(), hasStoreUsersOnly(), hasUsesOutsideLoop(), hasZeroSignBit(), INITIALIZE_PASS(), llvm::DivergenceAnalysis::inRegion(), insertSinCosCall(), llvm::isAllocaPromotable(), isAllocSiteRemovable(), isBroadcastShuffle(), isCallPromotable(), llvm::Constant::isConstantUsed(), isContiguous(), llvm::Function::isDefTriviallyDead(), isEmptyFunction(), isEphemeralValueOf(), llvm::RecurrenceDescriptor::isFirstOrderRecurrence(), isFuncOrArgAttr(), isFuncOrderCorrect(), isGOTEquivalentCandidate(), isHighCostExpansion(), isIgnorableInst(), isKnownNonNullFromDominatingCondition(), isLoadInvariantInLoop(), isLoopIncrement(), isNotUsedOrFreeInLoop(), isOnlyUsedInComparisonWithZero(), isOnlyUsedInEntryBlock(), isOnlyUsedInEqualityComparison(), llvm::isOnlyUsedInZeroEqualityComparison(), llvm::isOverflowIntrinsicNoWrap(), isPointerValueDeadOnEntryToFunction(), isProfitableChain(), isSafeAndProfitableToSinkLoad(), llvm::TargetFrameLowering::isSafeForNoCSROpt(), isSafePHIToSpeculate(), isSafeSelectToSpeculate(), isSafeSROAGEP(), llvm::isSafeToDestroyConstant(), isTargetConstant(), isUsedByLifetimeMarker(), isUsedOutsideOfDefiningBlock(), isValidCandidateForColdCC(), isVectorReductionOp(), LoadUsesSimpleEnoughForHeapSRA(), llvm::log2(), llvm::LowerDbgDeclare(), makeAllConstantUsesInstructions(), mapBinOpcode(), mapWasmLandingPadIndex(), MarkBlocksLiveIn(), matchUAddWithOverflowConstantEdgeCases(), mayLoopAccessLocation(), mergeInlinedArrayAllocas(), moveSpillUsesAfterCoroBegin(), moveUp(), llvm::InnerLoopVectorizer::needsScalarInduction(), negateICmpIfUsedByBranchOrSelectOnly(), NegateValue(), okayForPHIOfOps(), OnlyUsedBy(), llvm::onlyUsedByLifetimeMarkers(), optimizeDoubleFP(), performMaskedAtomicOp(), llvm::AlignmentFromAssumptionsPass::processAssumption(), processUGT_ADDCST_ADD(), processUMulZExtIdiom(), llvm::promoteLoopAccessesToScalars(), promoteSingleBlockAlloca(), PushDefUseChildren(), pushIVUsers(), PushLoopPHIs(), relocationViaAlloca(), llvm::safestack::StackColoring::removeAllMarkers(), RemoveInstInputs(), RemoveNestAttribute(), replaceAndRecursivelySimplifyImpl(), llvm::coro::replaceCoroFree(), replaceExtractElements(), ReplaceUsesOfWith(), reportMayClobberedLoad(), rewriteNonInstructionUses(), runImpl(), llvm::StackProtector::runOnFunction(), setCannotDuplicate(), shouldBeDeferred(), llvm::AArch64TTIImpl::shouldConsiderAddressTypePromotion(), simplifyAllocaArraySize(), simplifyAndDCEInstruction(), simplifyRelocatesOffABase(), sinkAndCmp0Expression(), AllocaSlices::SliceBuilder::SliceBuilder(), llvm::InstCombiner::SliceUpIllegalIntegerPHI(), llvm::SparseSolver< LatticeKey, LatticeVal, KeyInfo >::Solve(), splitGlobal(), swapMayExposeCSEOpportunities(), SwitchToLookupTable(), truncateIVUse(), tryPromoteAllocaToVector(), tryToElideArgumentCopy(), TryToShrinkGlobalToBoolean(), tryUnmergingGEPsAcrossIndirectBr(), usedInGlobalVarDef(), usedInOneFunc(), useFuncSeen(), ValueIsOnlyUsedLocallyOrStoredToOneGlobal(), llvm::slpvectorizer::BoUpSLP::vectorizeTree(), llvm::MemorySSA::verifyDomination(), llvm::LoopVersioning::versionLoop(), llvm::sroa::AllocaSliceRewriter::visit(), llvm::InstCombiner::visitShuffleVectorInst(), and ~Value(). Definition at line 403 of file Value.h. Definition at line 354 of file Value.h. Referenced by addIntrinsicToSummary(), llvm::IVUsers::AddUsersImpl(), AllUsesDominatedByBlock(), analyzeGlobalAux(), areFunctionArgsABICompatible(), canFoldInAddressingMode(), canFoldIVIncExpr(), llvm::createDeadArgHackingPass(), determinePointerReadAttrs(), llvm::GVNExpression::Expression::dump(), llvm::detail::PtrUseVisitorBase::enqueueUsers(), FindAllMemoryUses(), findCallsAtConstantOffset(), llvm::findDevirtualizableCallsForTypeCheckedLoad(), llvm::findDevirtualizableCallsForTypeTest(), findLoadCallsAtConstantOffset(), findProfitablePHIs(), findUses(), llvm::formLCSSAForInstructions(), llvm::StackSafetyInfo::FunctionInfo::FunctionInfo(), FunctionNumber(), GetCaseResults(), llvm::MemoryDependenceResults::getInvariantGroupPointerDependency(), llvm::GlobalsAAResult::getModRefBehavior(), getNarrowIntrinsic(), getParentPad(), getRetComponentType(), getStartOrEndSlot(), llvm::Function::hasAddressTaken(), hasSameExtUse(), hasUsesOutsideLoop(), isKnownTypeIdMember(), isSafeAndProfitableToSpeculateAroundPHI(), isSafeToPromoteArgument(), isSafeToSpeculatePHIUsers(), IsStoredObjCPointer(), llvm::Instruction::isUsedOutsideOfBlock(), llvm::AArch64TargetLowering::isZExtFree(), llvm::PredicateInfoClasses::ValueDFS_Compare::localComesBefore(), llvm::LowerDbgDeclare(), llvm::LoopInfo::movementPreservesLCSSAForm(), NewGVN::ValueDFS::operator<(), operator<<(), llvm::PointerMayBeCaptured(), predictValueUseListOrderImpl(), llvm::ValueEnumerator::print(), promoteArguments(), PropagateConstantsIntoArguments(), PushArgMD(), sinkInstruction(), transformToIndexedCompare(), truncateIVUse(), llvm::JumpThreadingPass::TryToUnfoldSelectInCurrBB(), llvm::MemorySSA::verifyDomination(), llvm::sroa::AllocaSliceRewriter::visit(), and visitPHIUsersAndDepsInPostOrder(). Definition at line 358 of file Value.h. Definition at line 78 of file Value.h. Definition at line 79 of file Value.h. Definition at line 120 of file Value.h. Referenced by llvm::User::getDescriptor(), llvm::CallBase::hasDescriptor(), llvm::User::operator delete(), and llvm::User::operator new(). Definition at line 119 of file Value.h. Referenced by llvm::User::allocHungoffUses(), llvm::User::getDescriptor(), llvm::User::getOperandList(), llvm::User::growHungoffUses(), llvm::User::Op(), llvm::User::operator delete(), llvm::User::operator new(), llvm::User::setNumHungOffUseOperands(), and llvm::User::User(). Definition at line 118 of file Value.h. Referenced by getValueName(), hasName(), and setValueName(). Definition at line 117 of file Value.h. Referenced by llvm::ValueAsMetadata::get(), llvm::ValueAsMetadata::handleRAUW(), and isUsedByMetadata(). This is the greatest alignment value supported by load, store, and alloca instructions, and global values. Definition at line 594 of file Value.h. Definition at line 595 of file Value.h. Referenced by emitSignedInt64(), llvm::AlignmentFromAssumptionsPass::extractAlignmentInfo(), forEachUser(), llvm::getOrEnforceKnownAlignment(), getParentPad(), isContiguous(), parseOptionalLinkageAux(), llvm::GlobalObject::setAlignment(), llvm::AllocaInst::setAlignment(), llvm::LoadInst::setAlignment(), and llvm::StoreInst::setAlignment(). Definition at line 114 of file Value.h. Referenced by llvm::User::getNumOperands(), llvm::User::getOperand(), llvm::User::getOperandUse(), llvm::User::Op(), llvm::User::op_end(), llvm::User::operator delete(), llvm::User::operator new(), llvm::User::setGlobalVariableNumOperands(), llvm::User::setNumHungOffUseOperands(), llvm::User::setOperand(), and llvm::User::User(). This member is similar to SubclassData, however it is for holding information which may be used to aid optimization, but which may be cleared to zero without affecting conservative interpretation. Definition at line 90 of file Value.h. Referenced by llvm::SelectInst::areInvalidOperands(), llvm::BinaryConstantExpr::BinaryConstantExpr(), clearSubclassOptionalData(), llvm::Instruction::clone(), llvm::GetElementPtrConstantExpr::Create(), llvm::ConstantExprKeyType::create(), llvm::CallInst::Create(), llvm::InvokeInst::Create(), llvm::CallBrInst::Create(), llvm::CallInst::CreateFree(), llvm::FenceInst::FenceInst(), llvm::ConstantExpr::getAsInstruction(), llvm::FPMathOperator::getFastMathFlags(), llvm::GEPOperator::getInRangeIndex(), llvm::InvokeInst::getLandingPadInst(), getRawSubclassOptionalData(), llvm::ConstantExpr::getWithOperands(), llvm::FPMathOperator::hasAllowContract(), llvm::FPMathOperator::hasAllowReassoc(), llvm::FPMathOperator::hasAllowReciprocal(), llvm::FPMathOperator::hasApproxFunc(), llvm::FPMathOperator::hasNoInfs(), llvm::FPMathOperator::hasNoNaNs(), llvm::OverflowingBinaryOperator::hasNoSignedWrap(), llvm::FPMathOperator::hasNoSignedZeros(), llvm::OverflowingBinaryOperator::hasNoUnsignedWrap(), hasSameSubclassOptionalData(), llvm::ShuffleVectorInst::isConcat(), llvm::PossiblyExactOperator::isExact(), llvm::FPMathOperator::isFast(), llvm::Instruction::isIdenticalTo(), llvm::CmpInst::isImpliedFalseByMatchingCmp(), llvm::GEPOperator::isInBounds(), llvm::CallBase::populateBundleOperandInfos(), llvm::SwitchInst::removeCase(), and llvm::UnreachableInst::UnreachableInst().